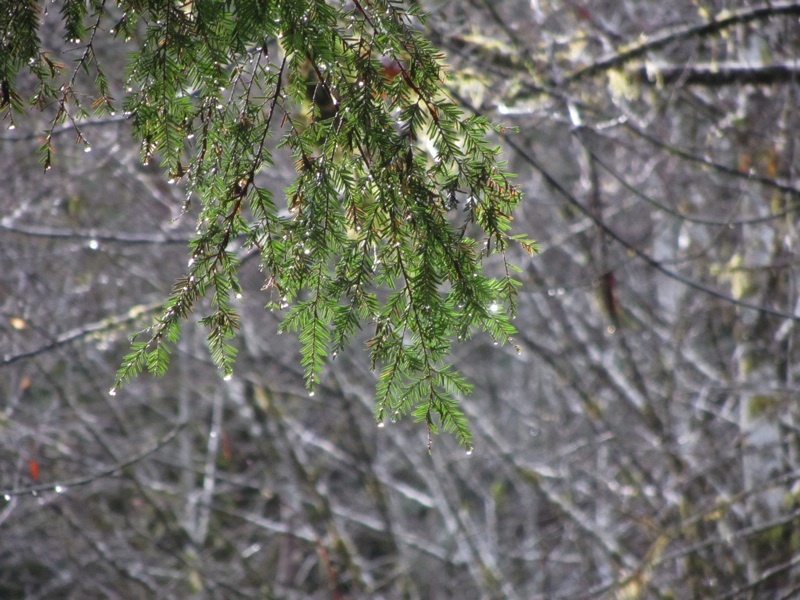 If you live in the Pacific Northwest, you have to like rain. 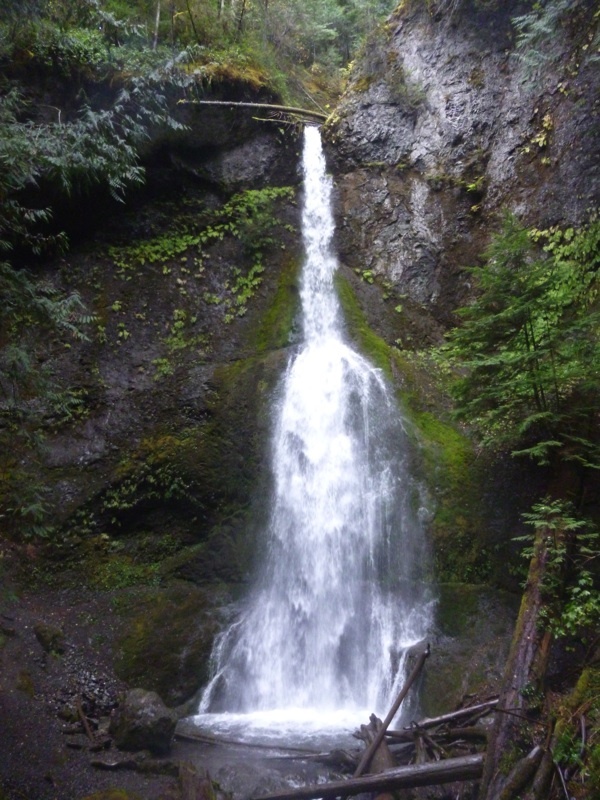 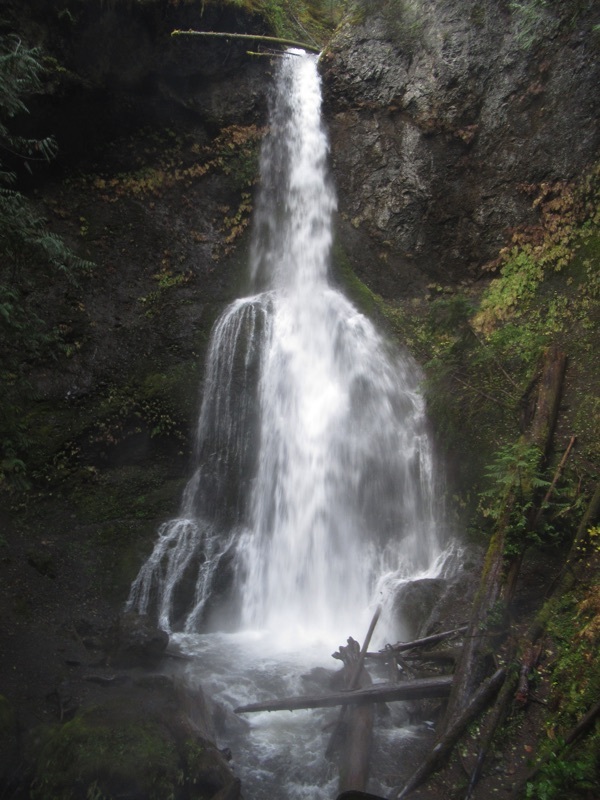 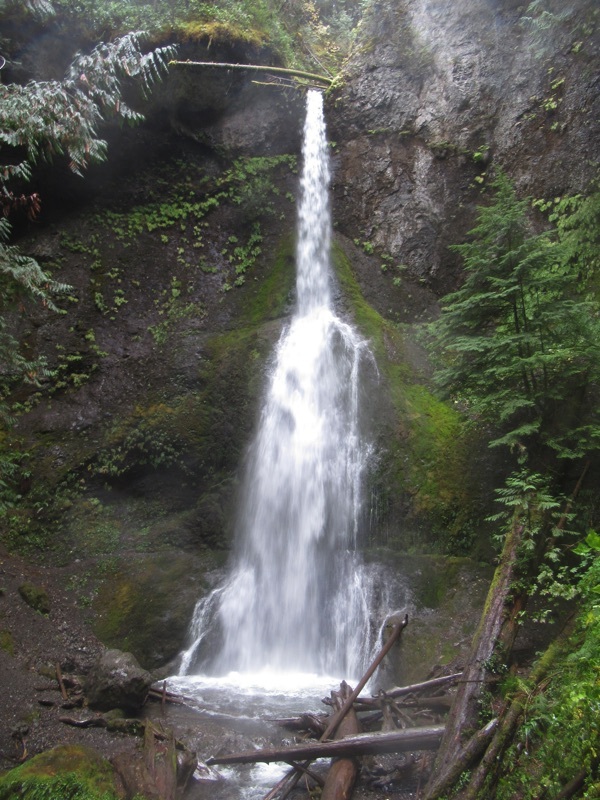 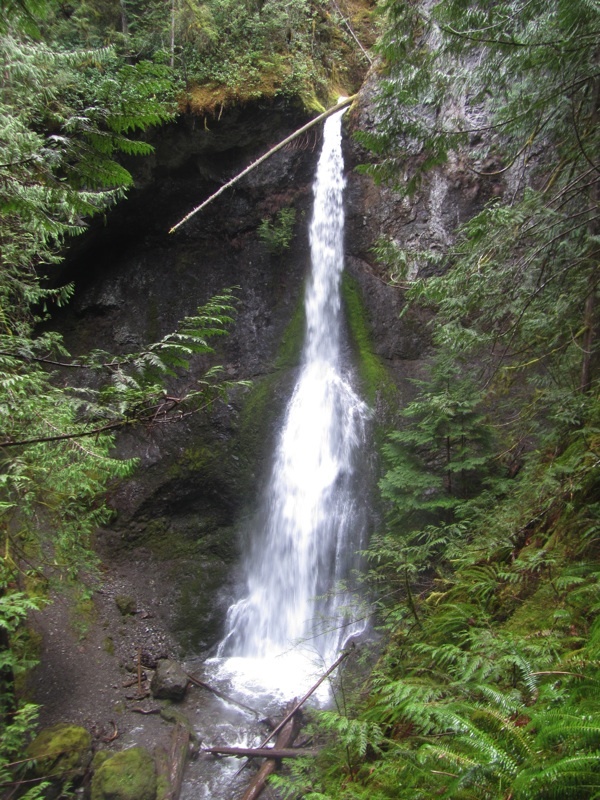 We like rain, and one of the great things to do here on a rainy day is to go visit a waterfall like Marymere Falls on Lake Crescent. 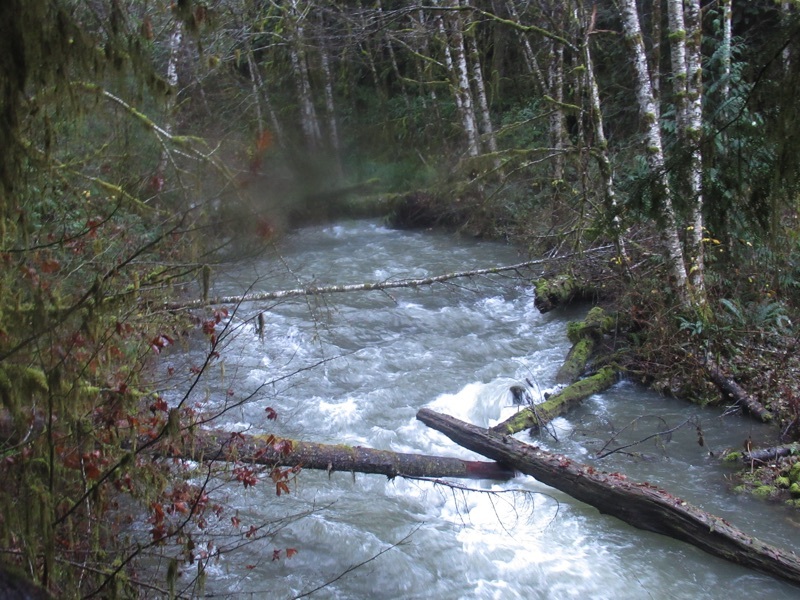 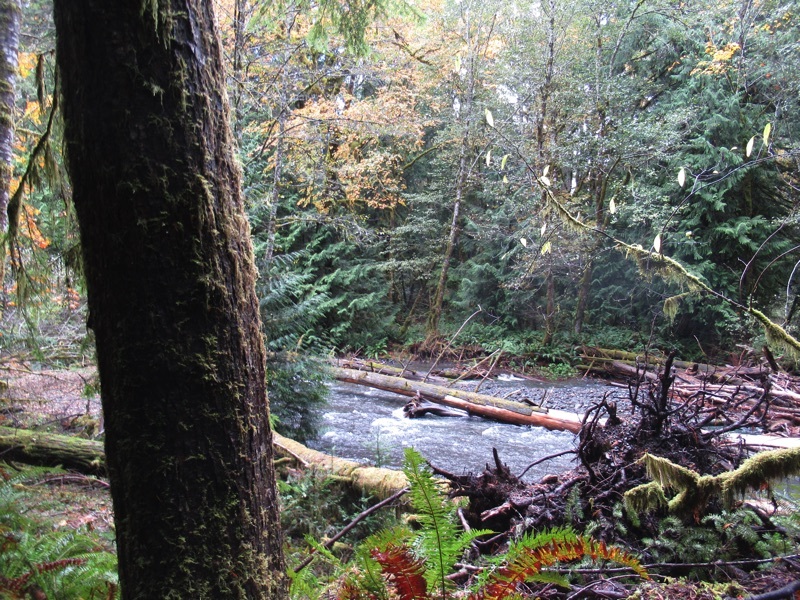 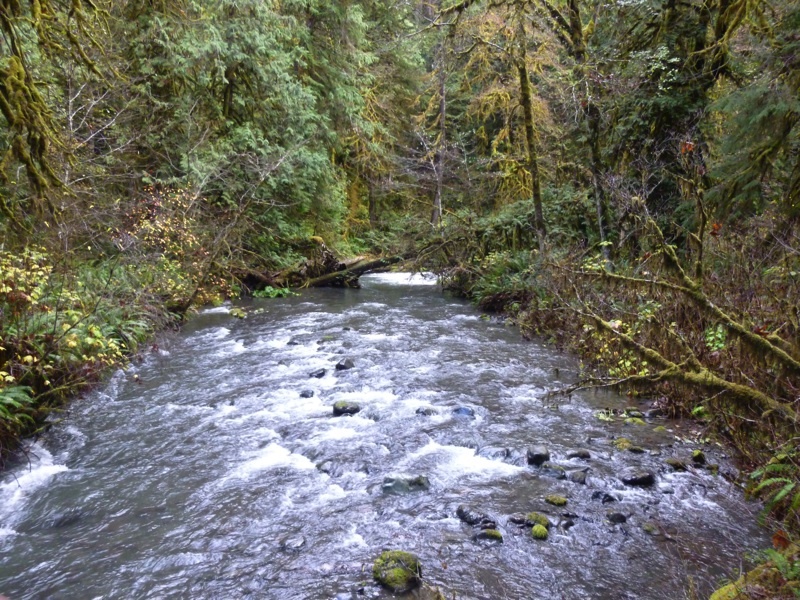 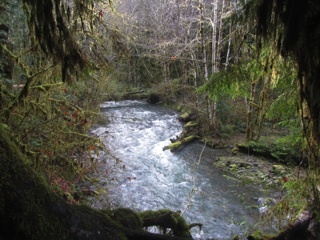 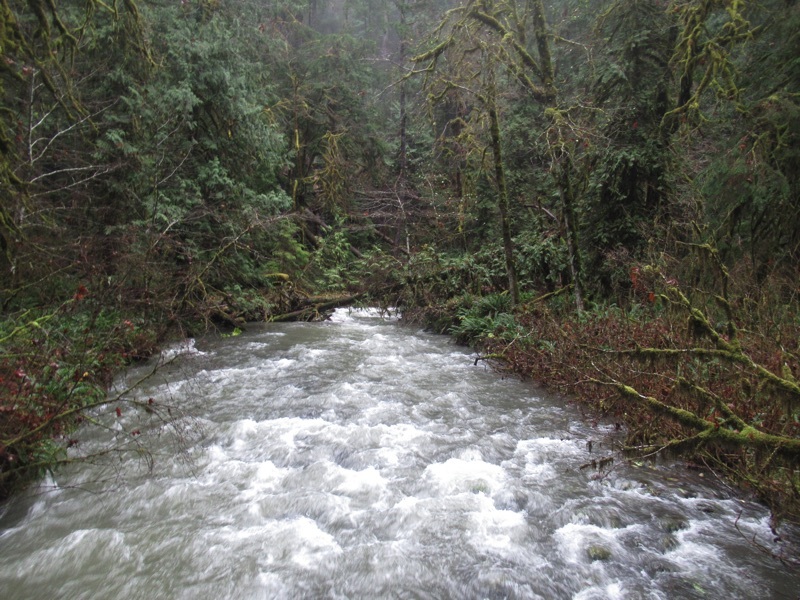 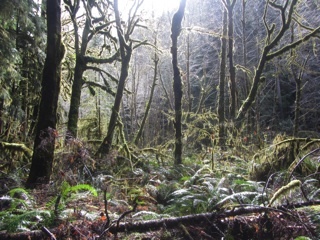 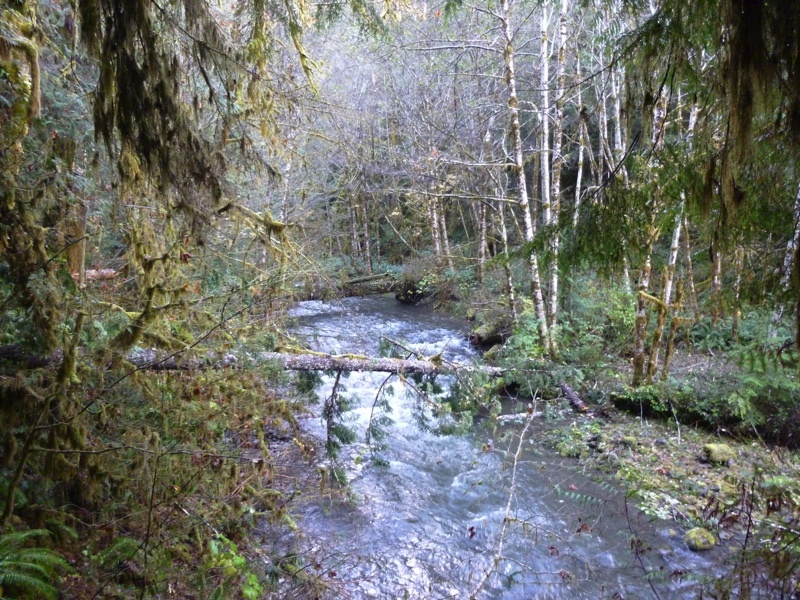 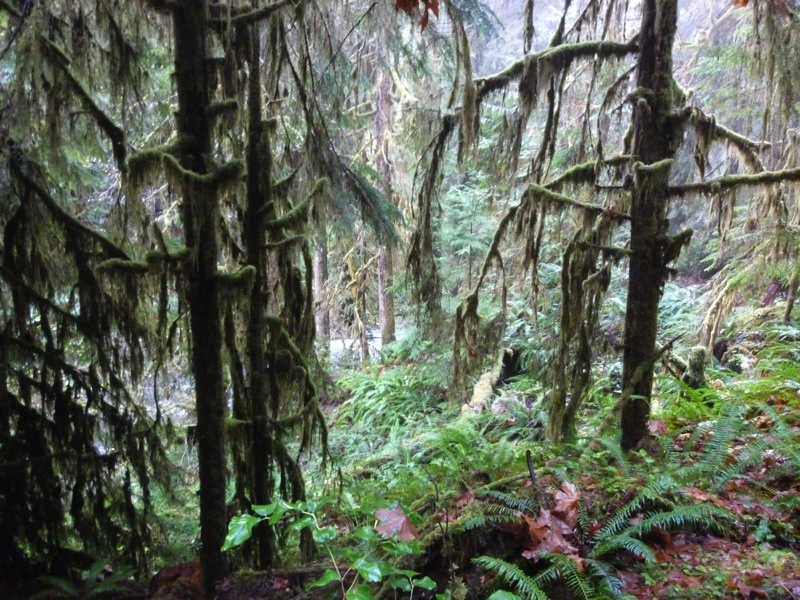 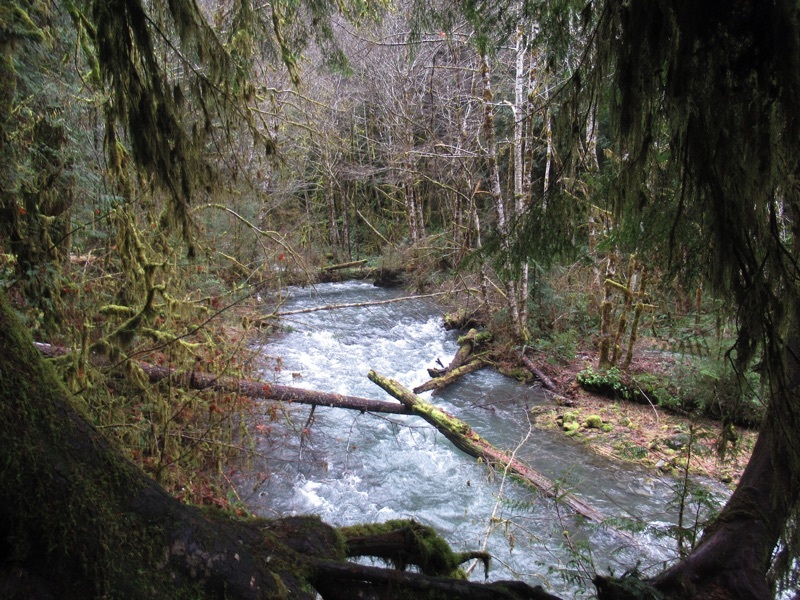 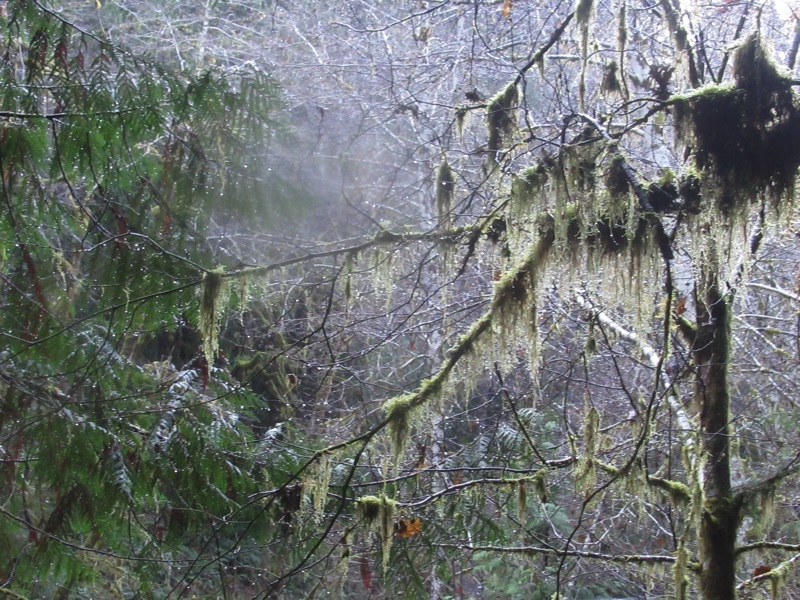 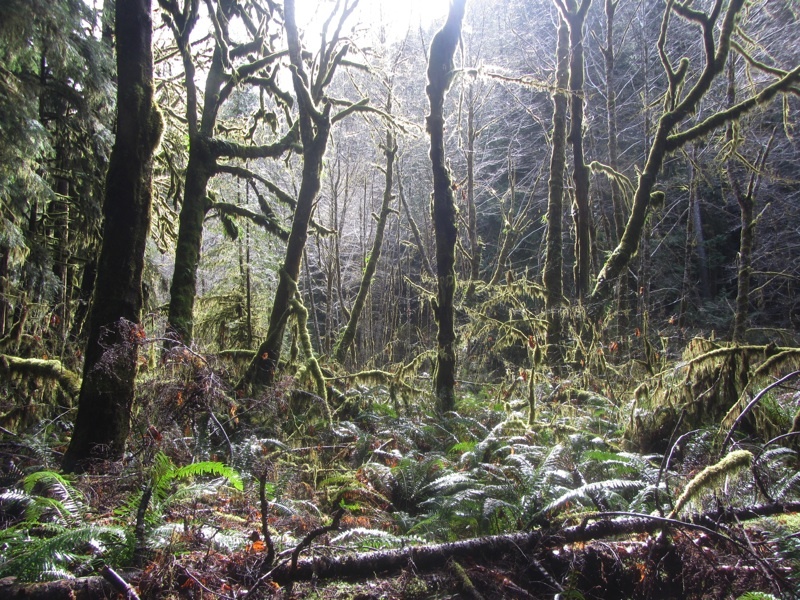 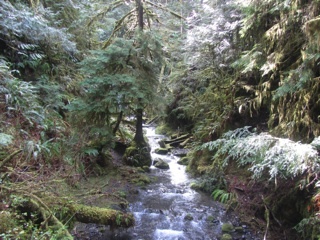 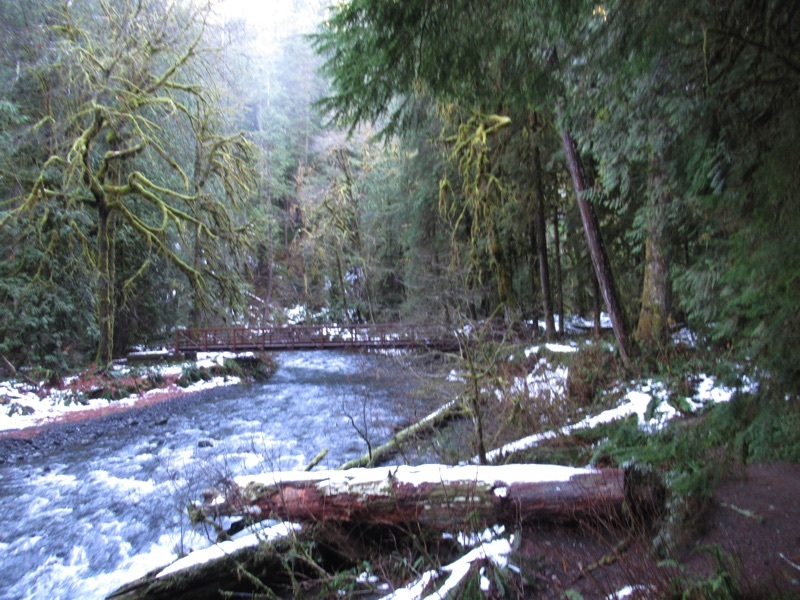 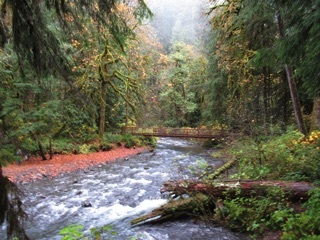 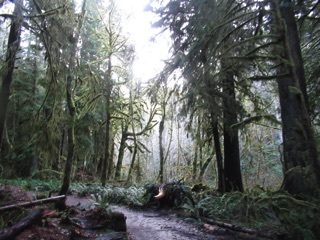 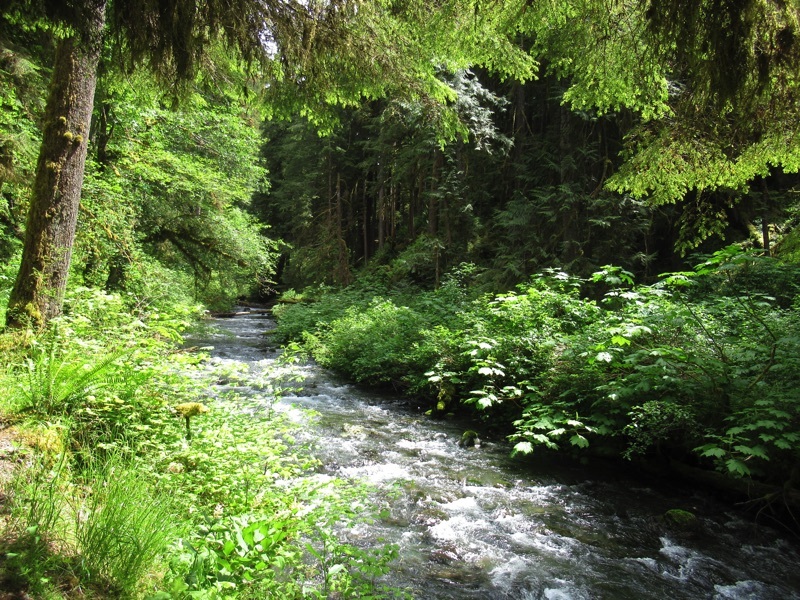 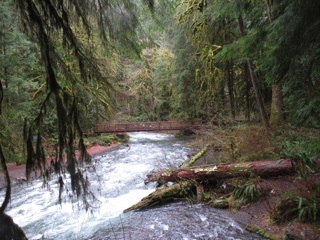 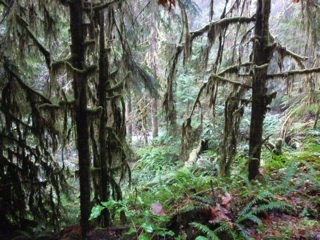 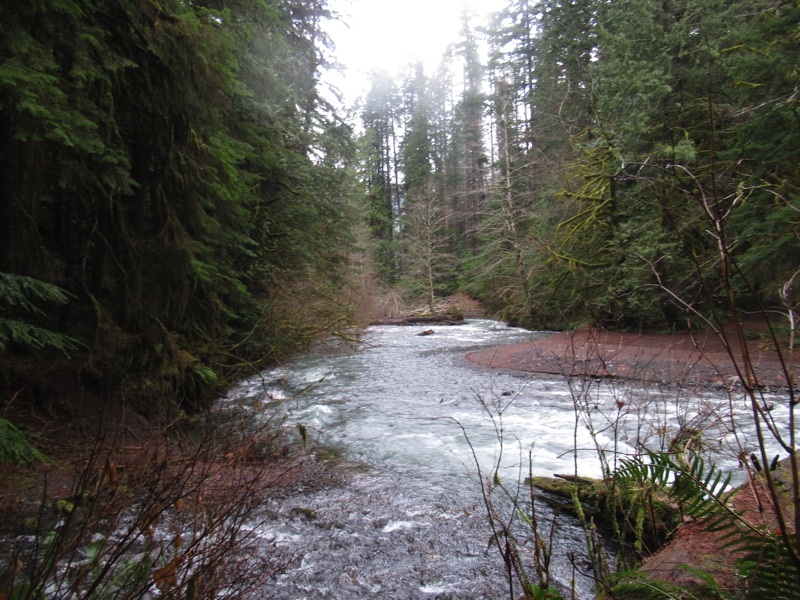 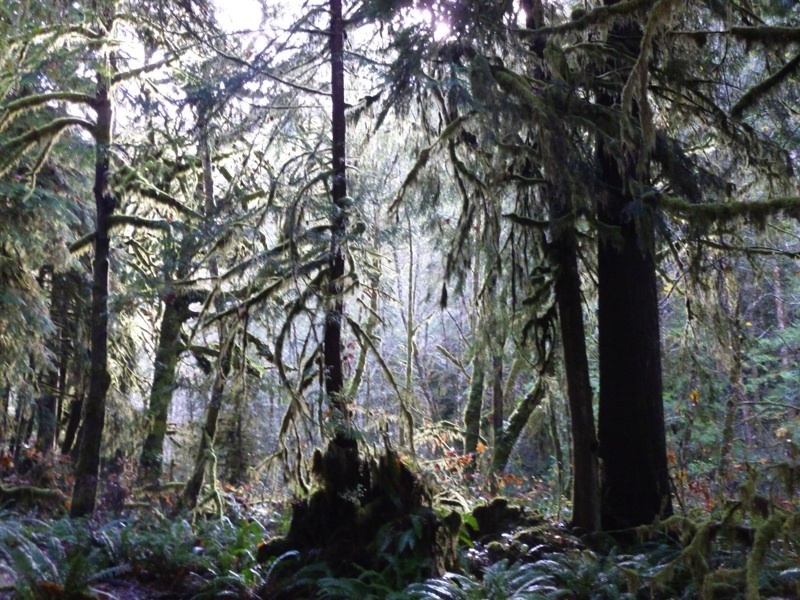 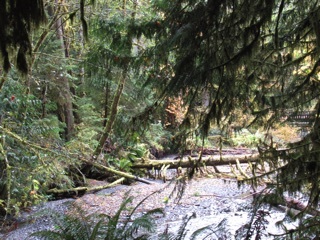 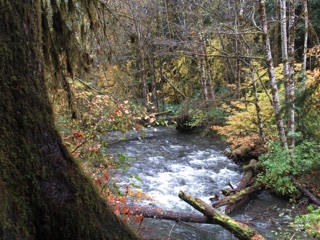 The forest is at its best in the gloom and damp, and Barnes Creek was roaring white with foam. The falls themselves were in full spate, even spraying the viewing platforms. 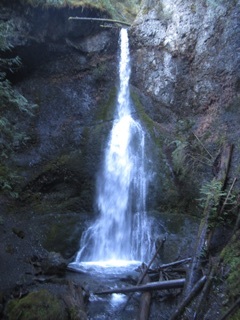 Now that construction on 101 along Lake Crescent has stopped for the winter, we went out to Marymere Falls. 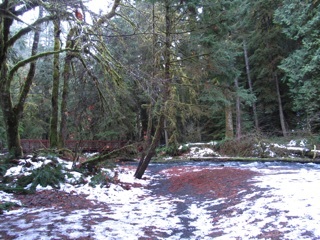 There was a bit of snow on the ground, and the forest was in its wintry colors. 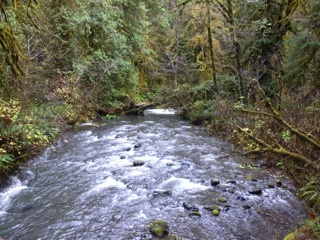 Barnes Creek was silver blue and running freshly. 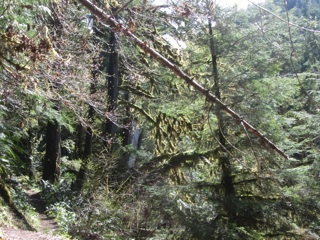 It wasn't a long walk. 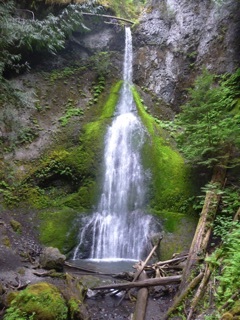 The loop to the falls takes less than an hour, but it was nice getting out to an old favorite hike. 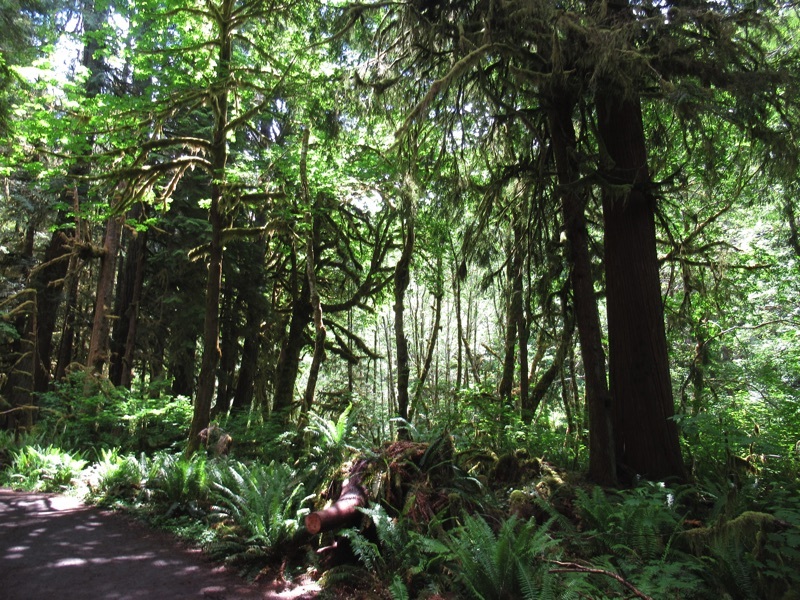 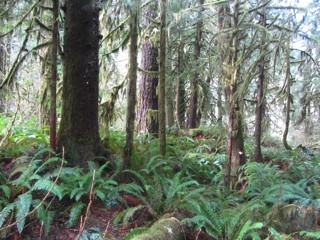 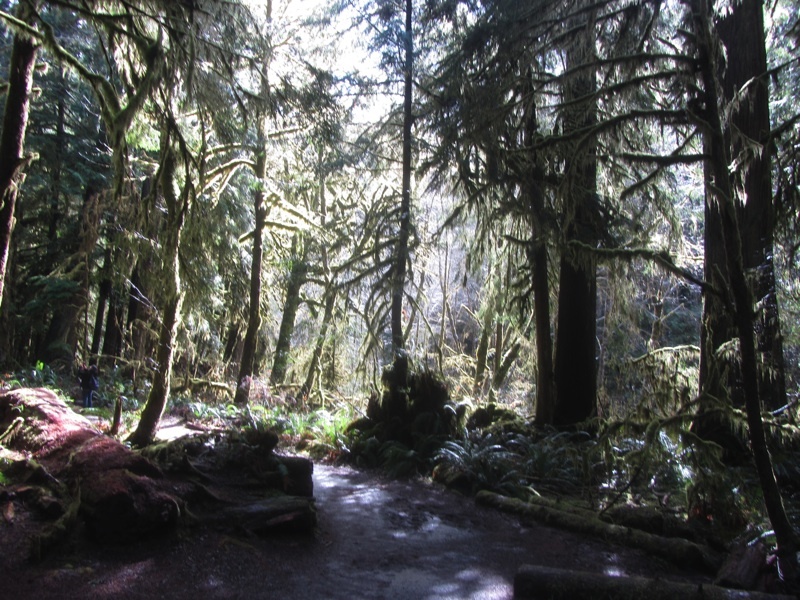 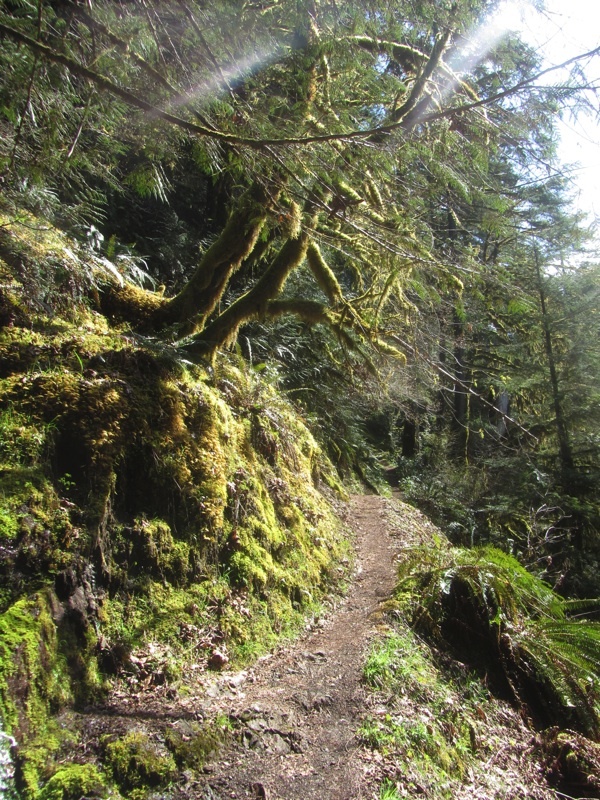 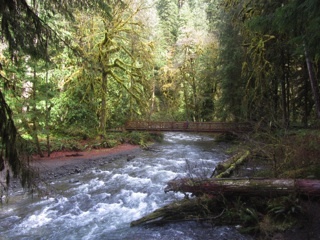 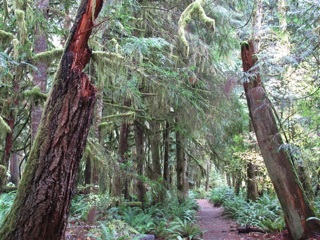 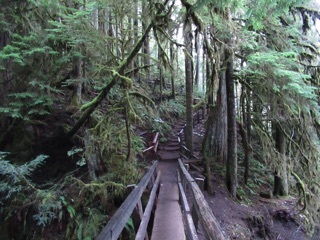 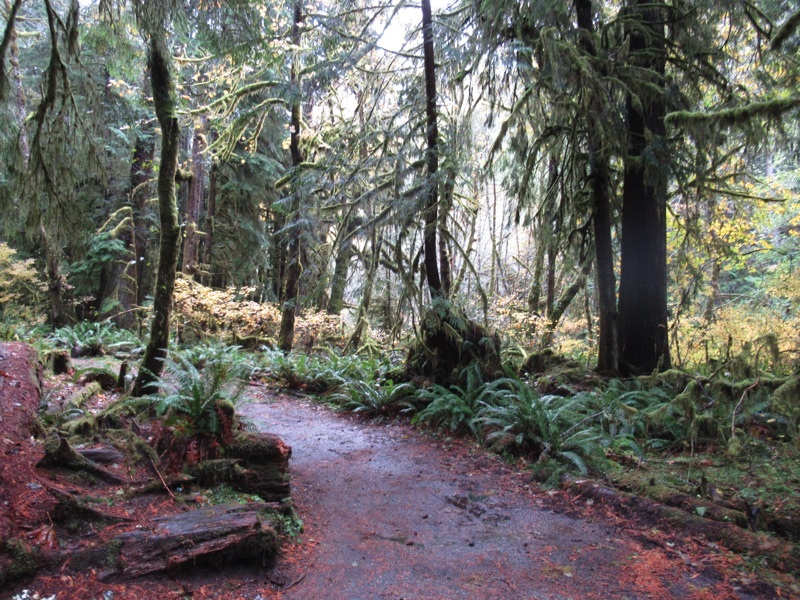 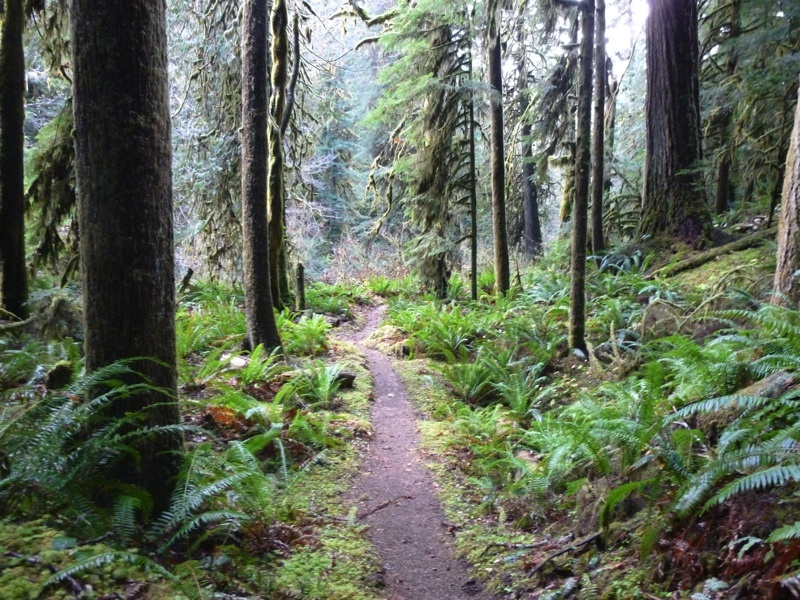 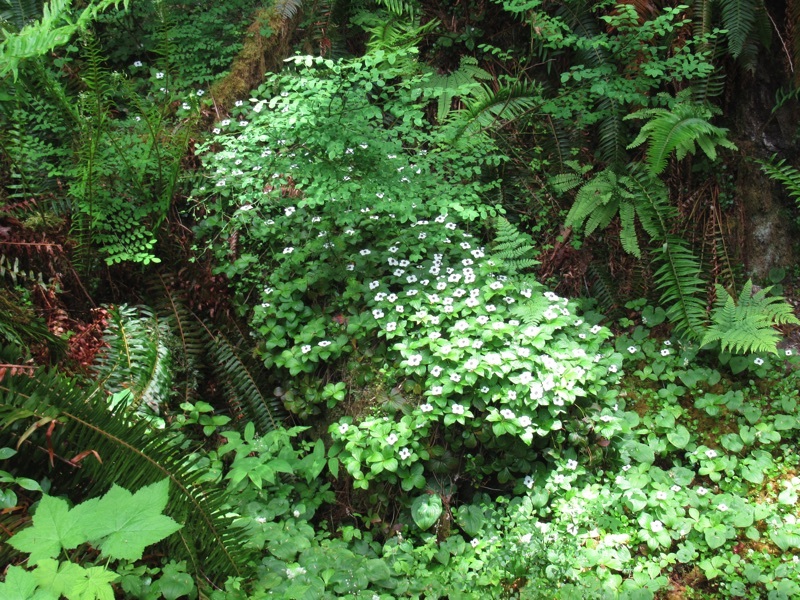 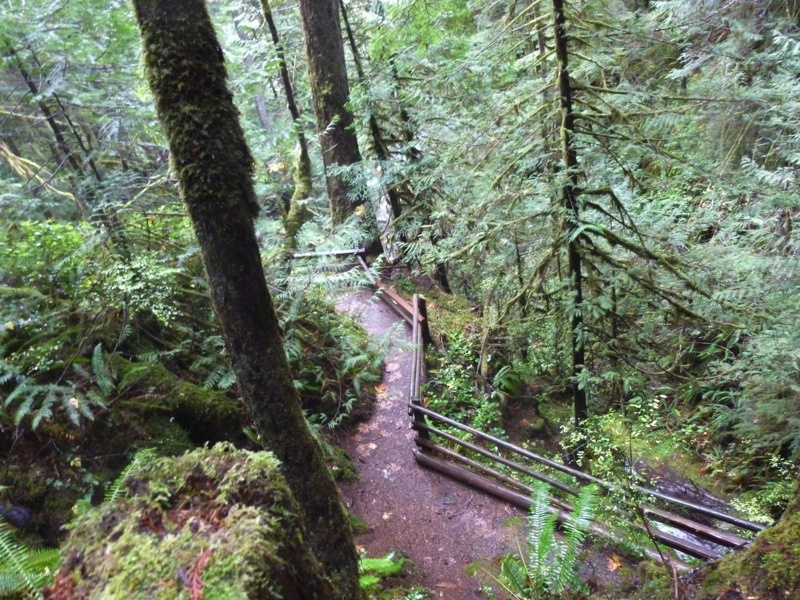 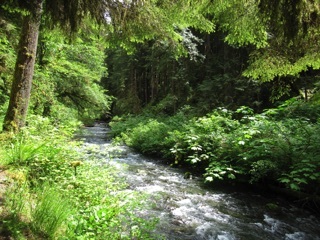 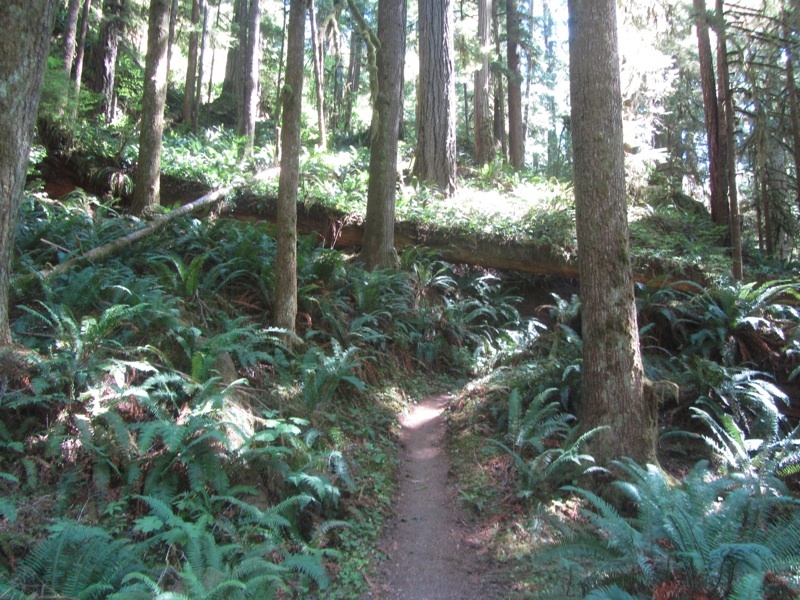 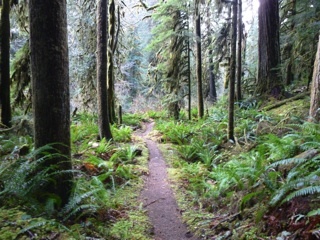 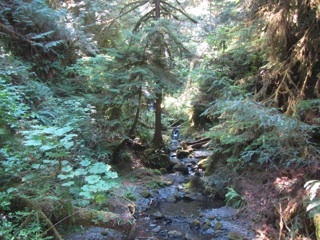 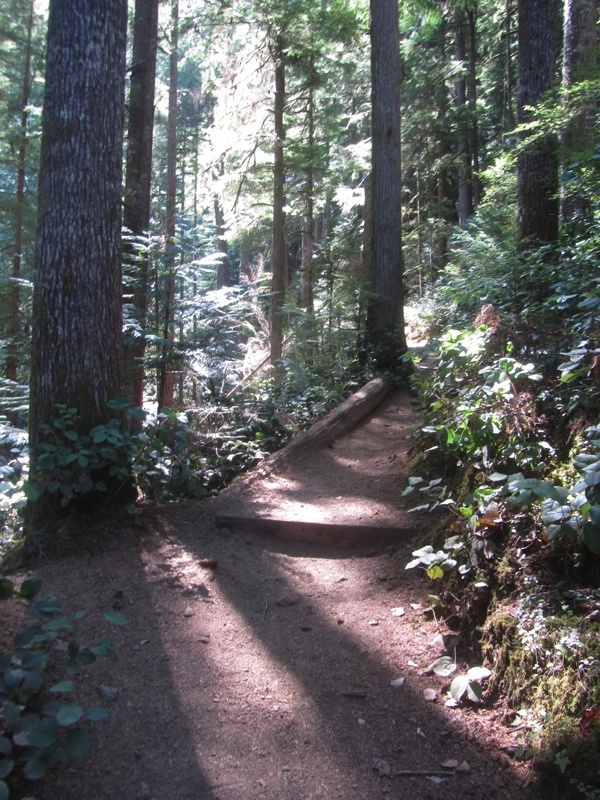 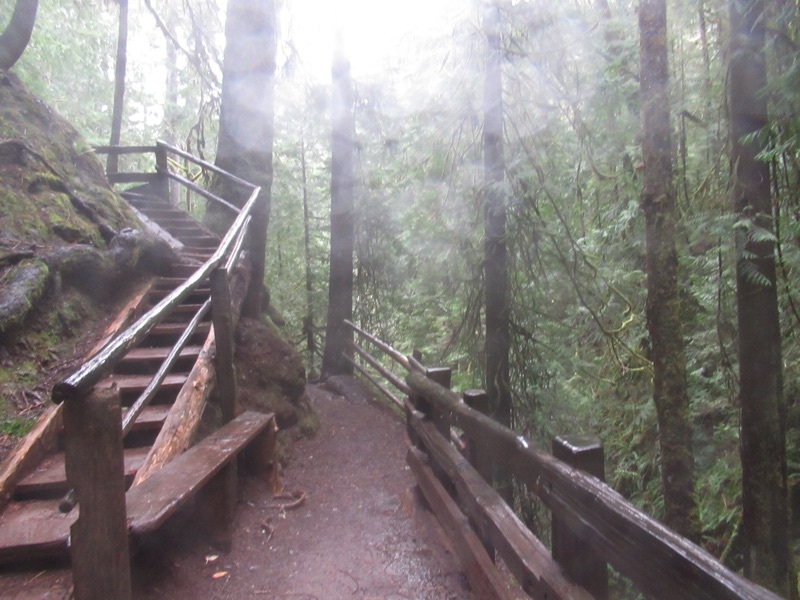 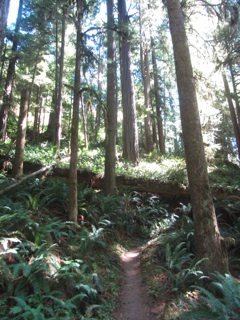 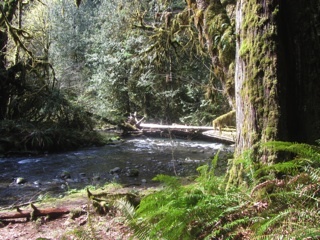 The Barnes Creek trail is a little gem starting on the south side of Lake Crescent. 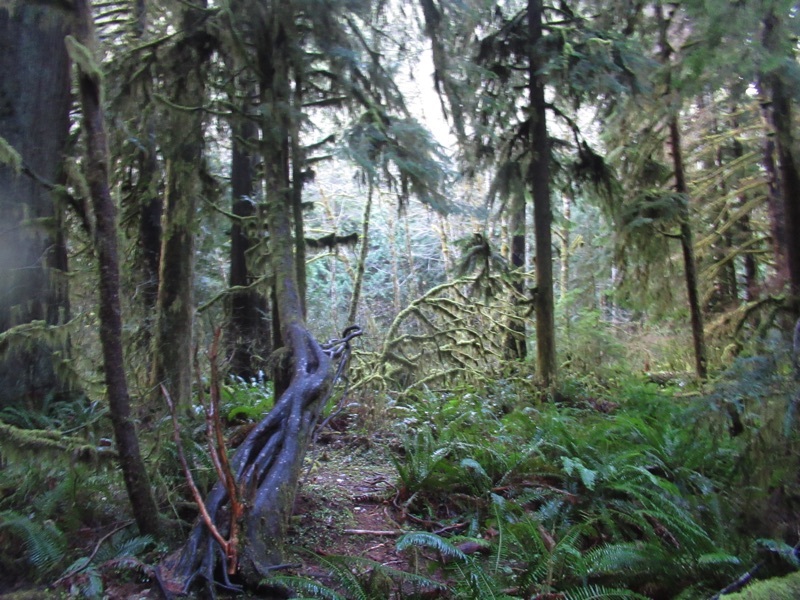 The forest is much wilder than one might expect for a place so accessible. 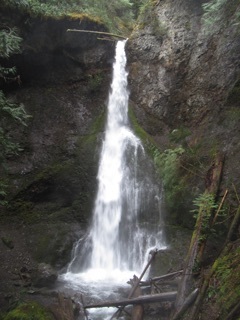 We made a quick side trip to Marymere Falls which was running full spate. 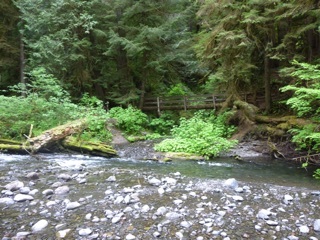 Then we headed up Barnes Creek a bit. Most people just do the loop to the falls, but the trail along the creek has its rewards. We had some good views of the creek, and we got to see our favorite little waterfall before heading back. 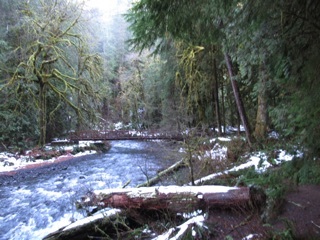 It has been a wintry month, and we haven't been getting out as much as we'd like. 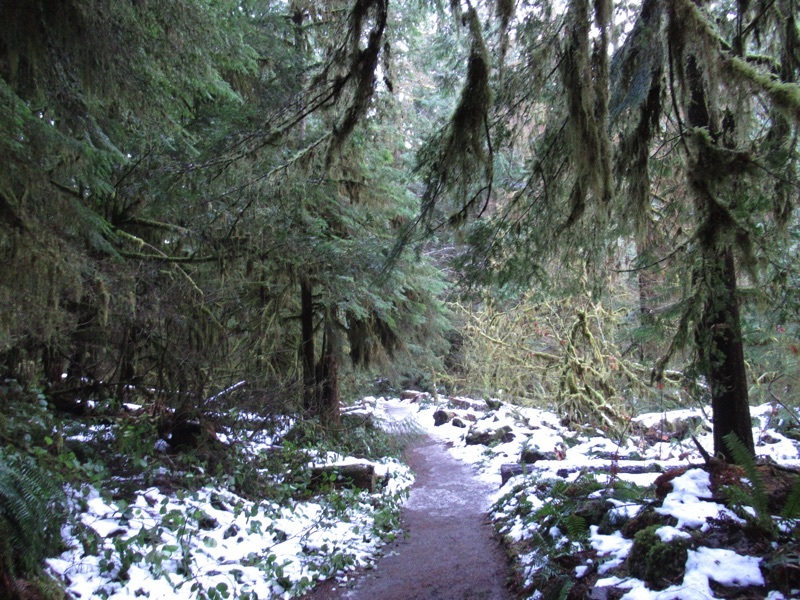 If nothing else, the Spruce Railroad Trail and all of the Elwha Valley trails are closed for construction and the high country is covered with snow. We did get out to Marymere Falls. 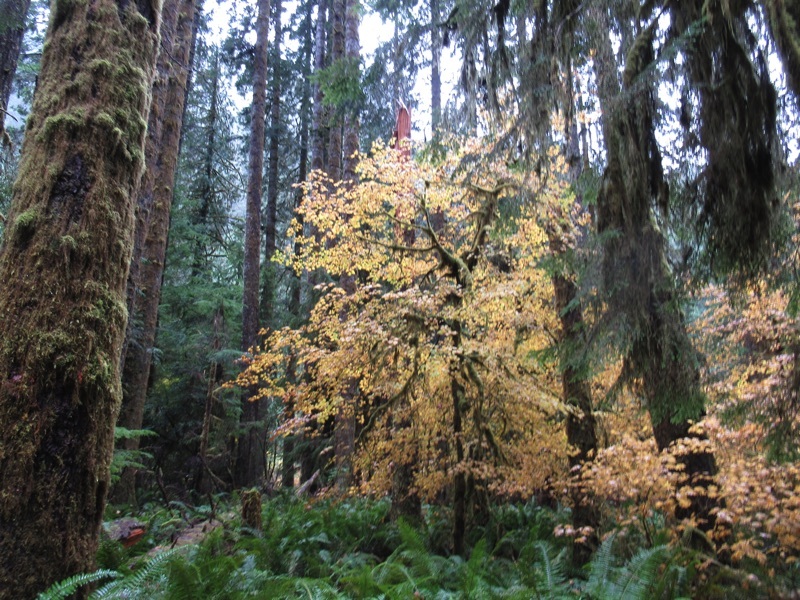 It was a short walk from the parking lot, less than an hour round trip, but it was a nice taste of northwestern forest for the season. 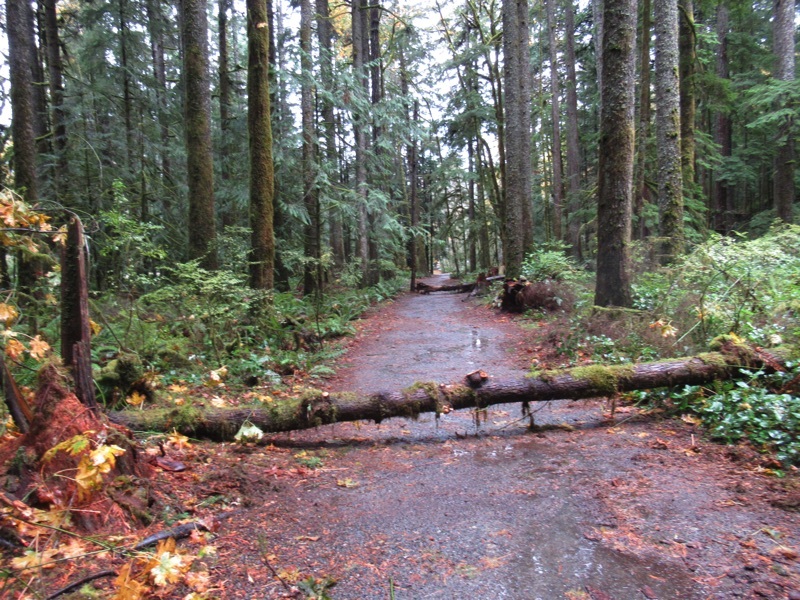 So many trails are closed this winter. 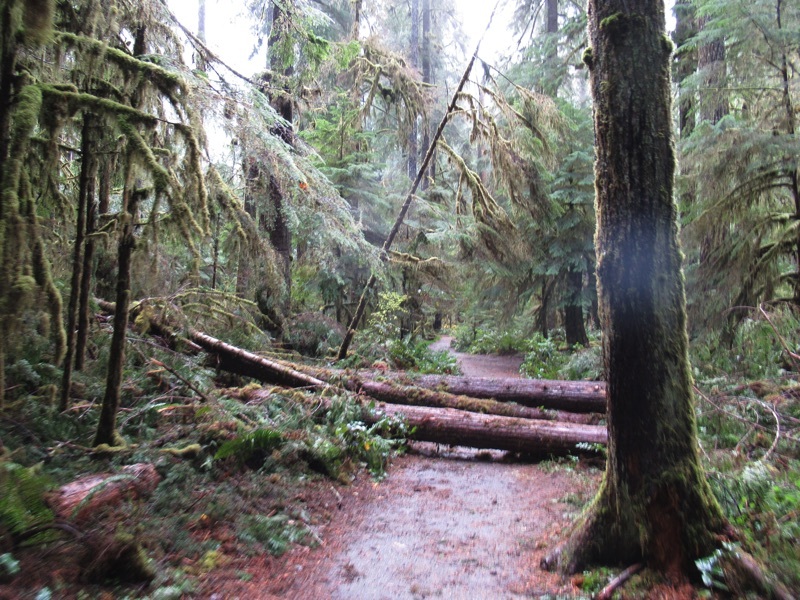 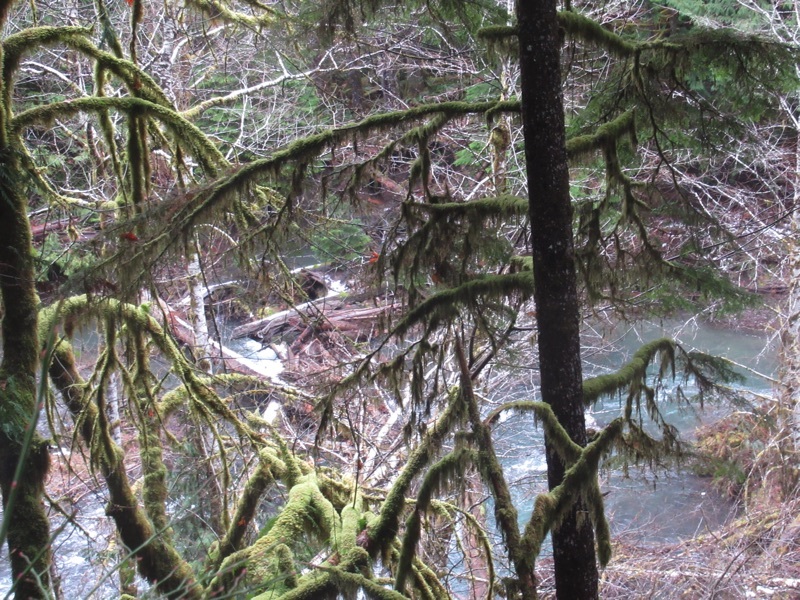 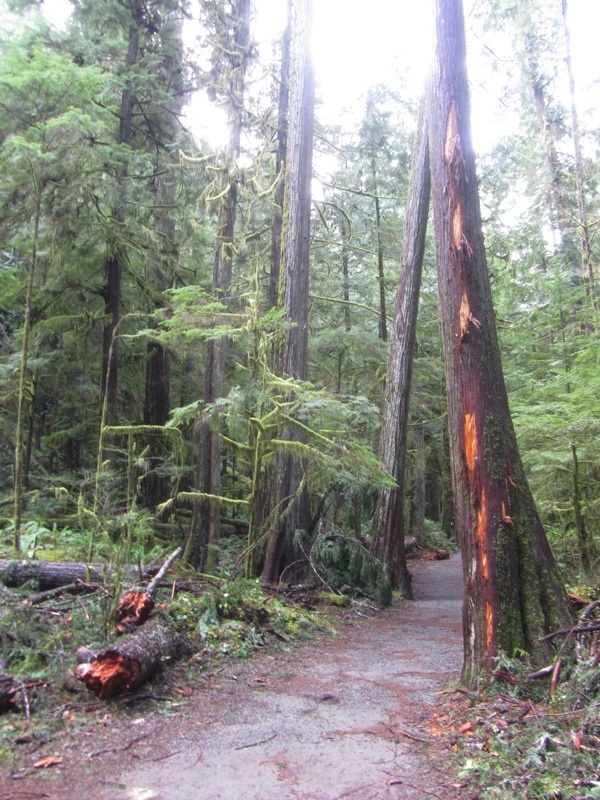 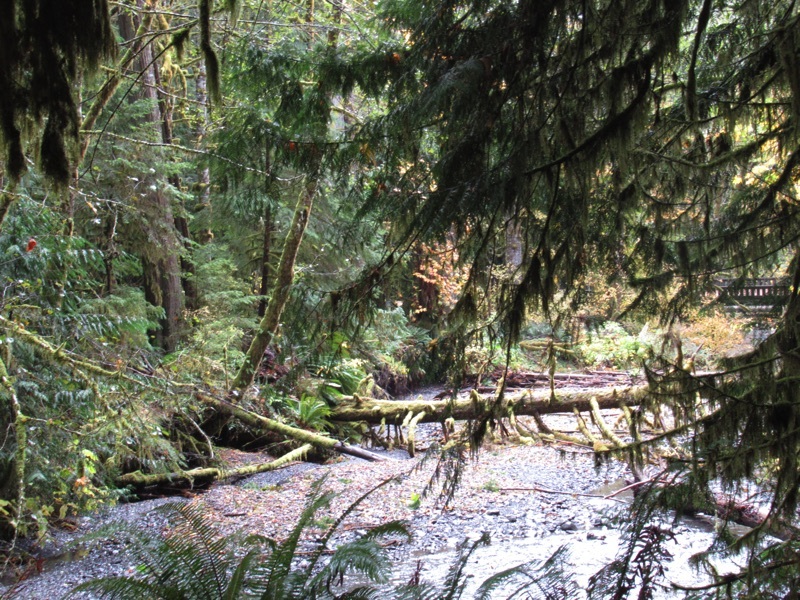 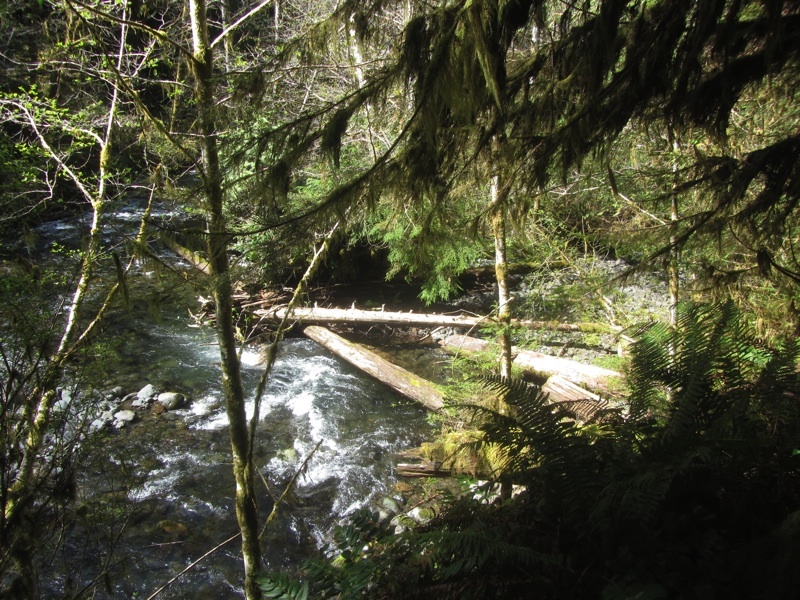 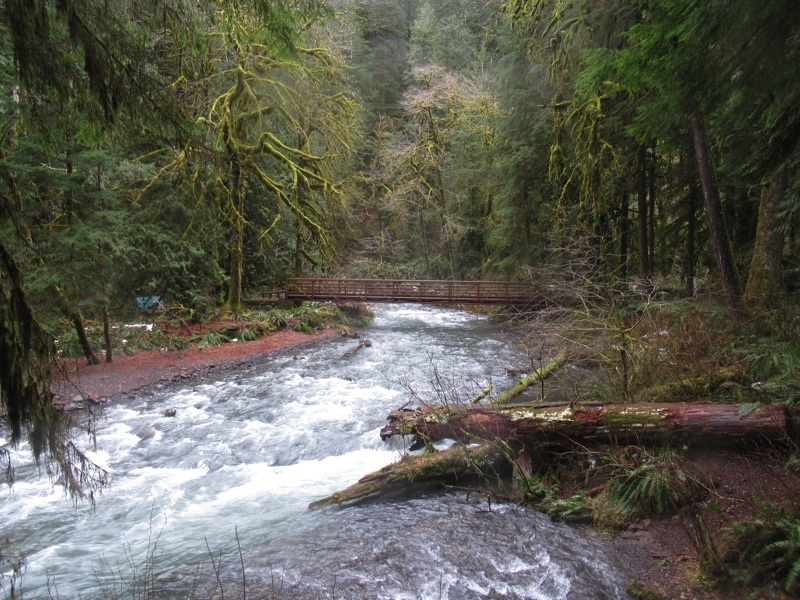 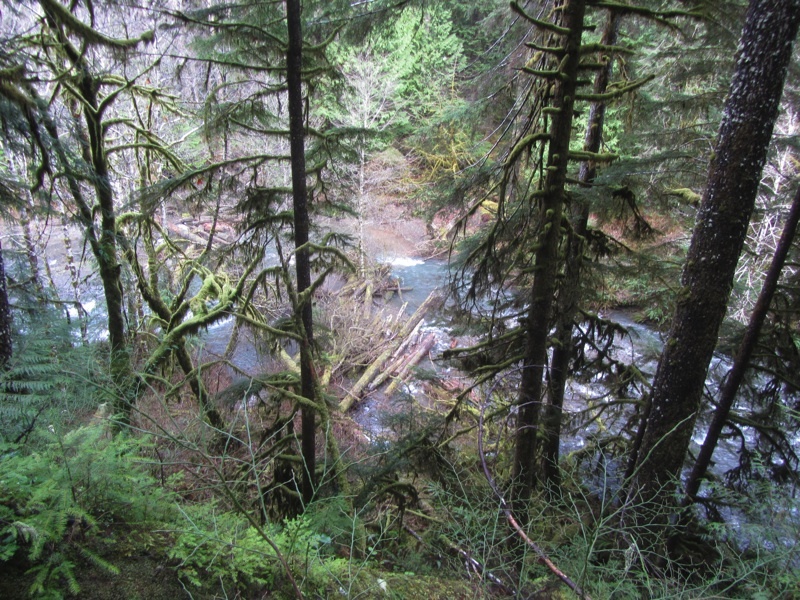 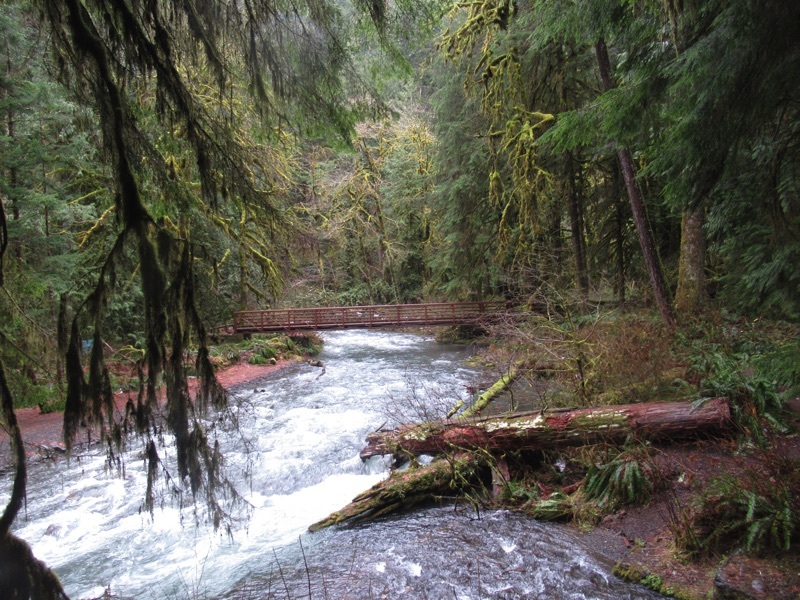 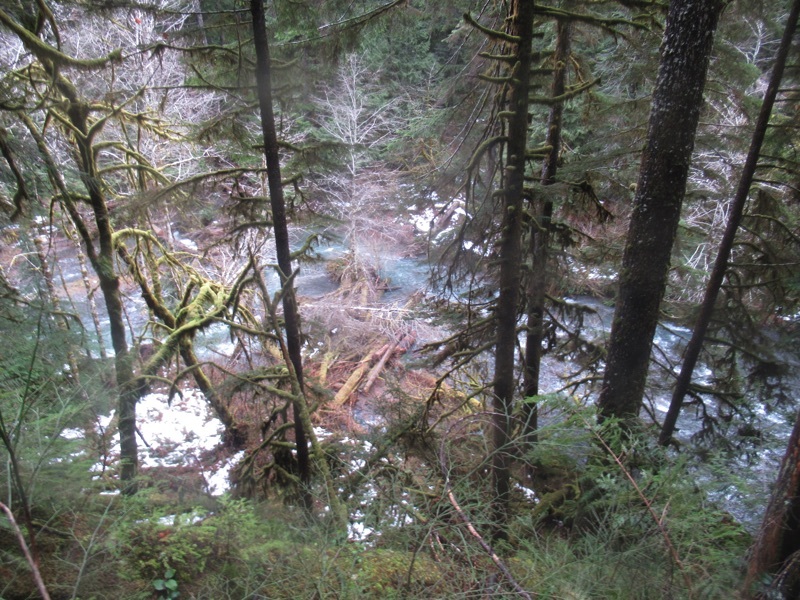 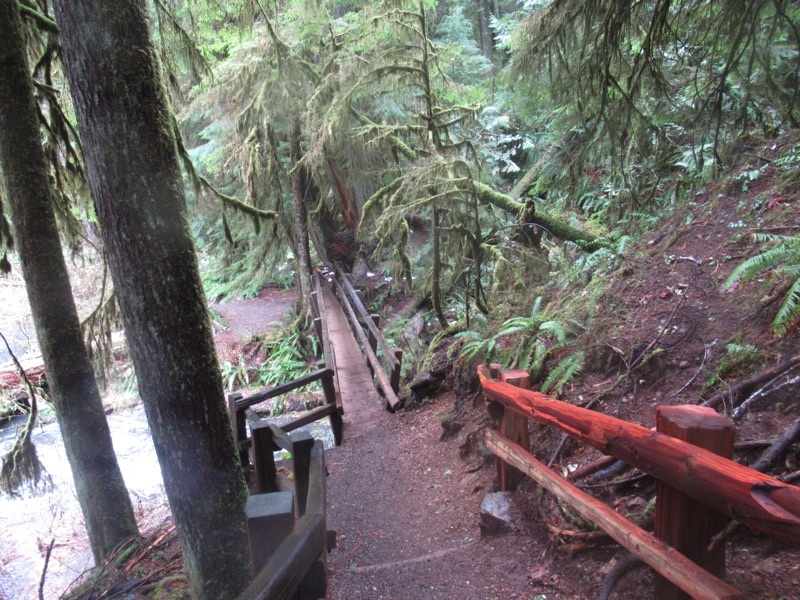 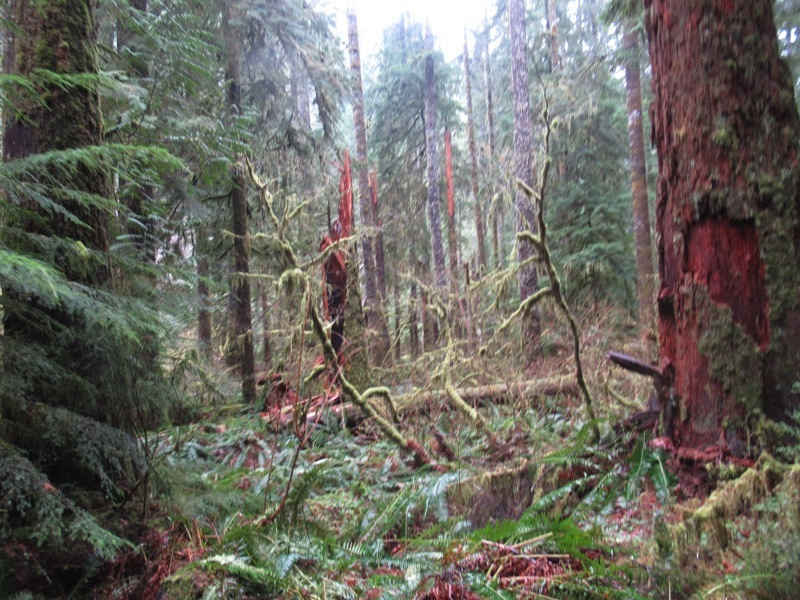 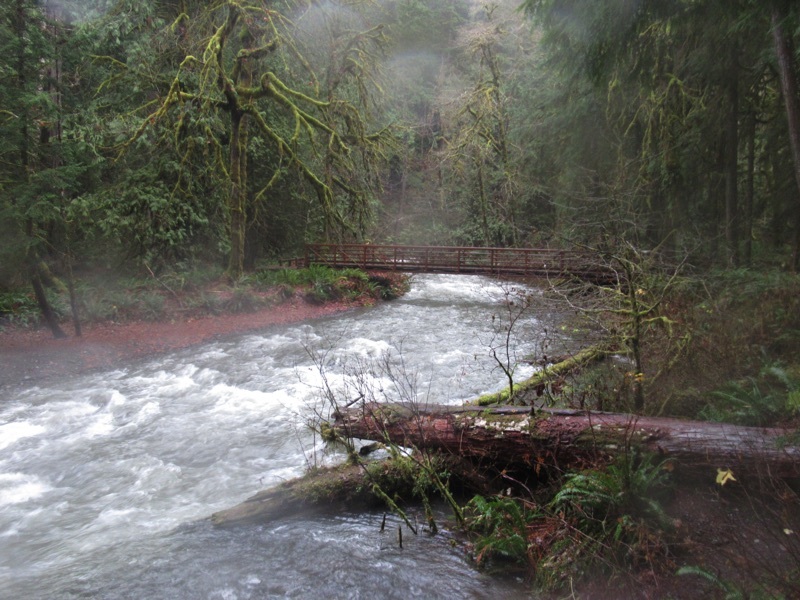 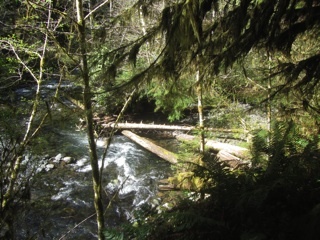 Most of the Elwha River trails are closed while the flood damage is repaired, and the Spruce Railroad Trail is closed for the next step in its upgrade. 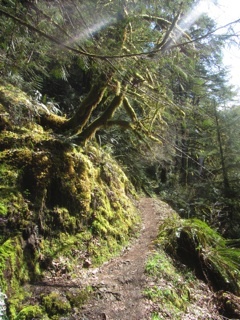 The loop to Marymere Falls is one of the few trails still open, so we've been getting there fairly often. For a while, the trail was covered with snow. 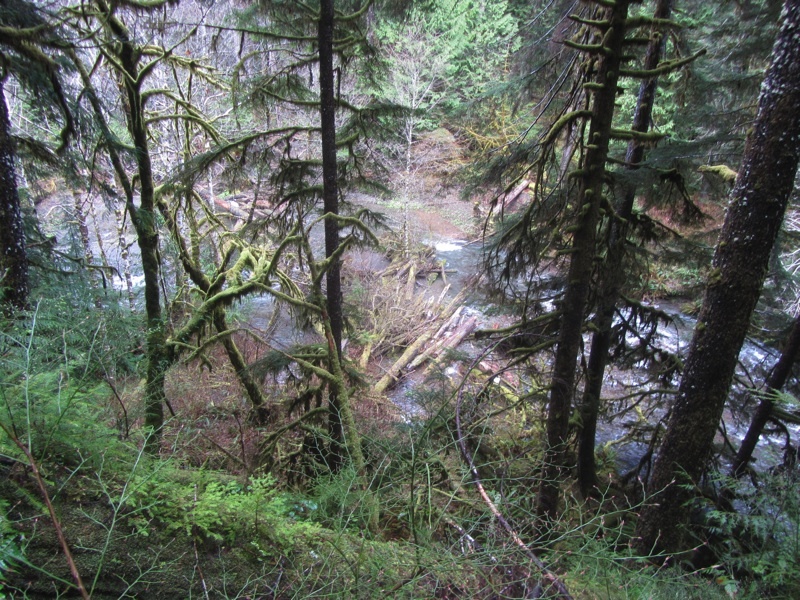 The Barnes Valley doesn't get a lot of sun this time of year, but the snows have melted, and the snow melt and recent rains have fed the river and the falls. The big wind storm seems to have spared Port Angeles and the immediate vicinity, but outside of the rain shadow of the Olympic Mountains there was wind to spare. 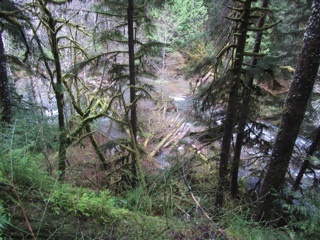 We checked out Marymere Falls and found plenty of windfall. 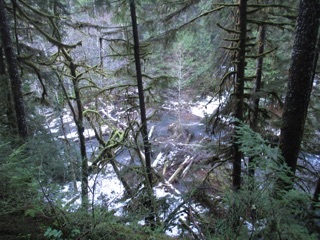 Trees had fallen across the trail, but we made our way to the roaring falls. 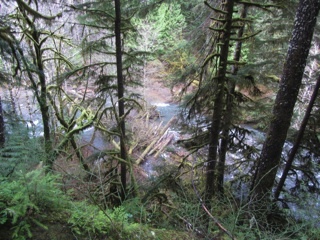 We had planned to head up Barnes Creek a bit, but the wind fall and brush were too much for us. 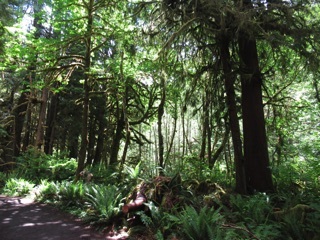 Instead we went back the long way passing by the lodge. 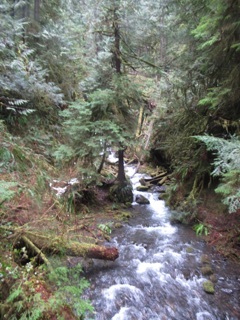 We followed the river down to the lake proper, then cut back inland. More color - This has been a great year. 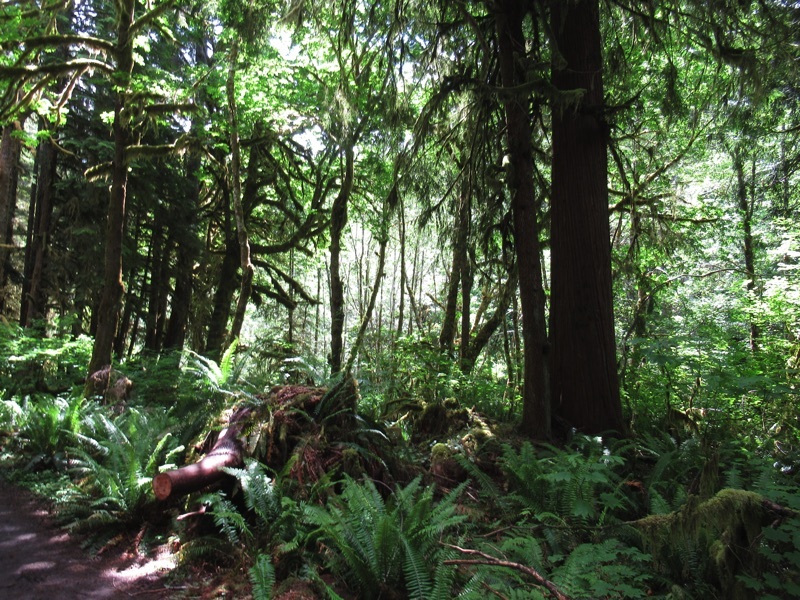 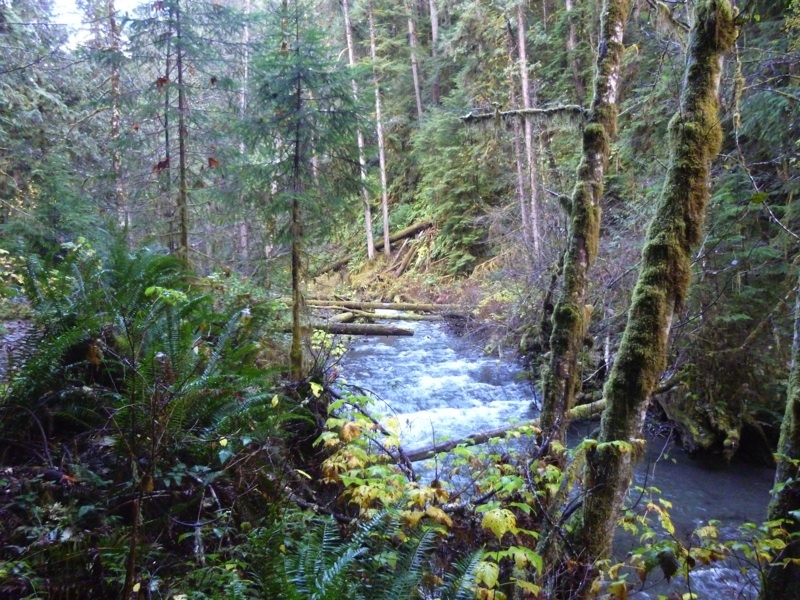 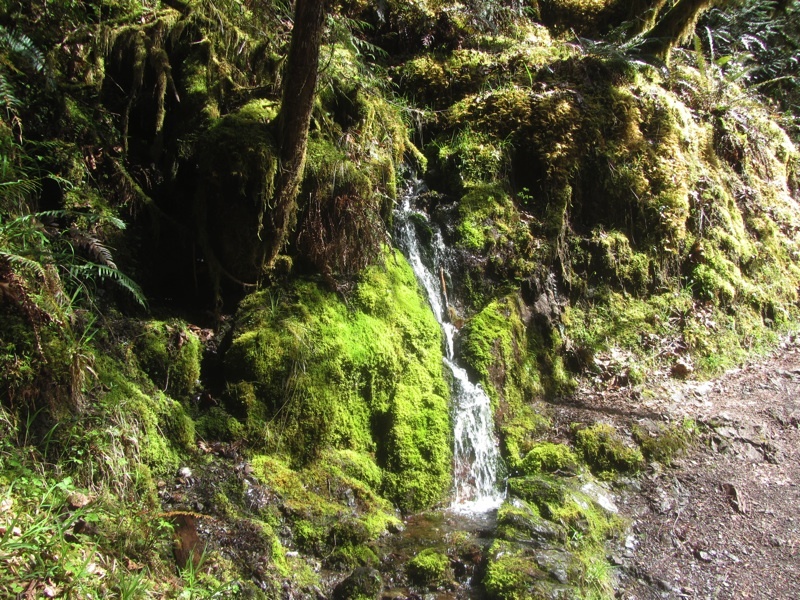 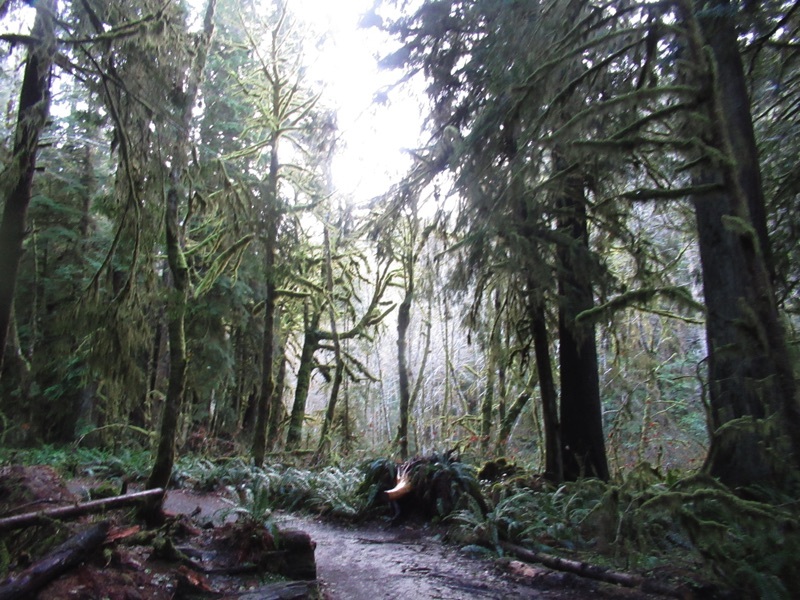 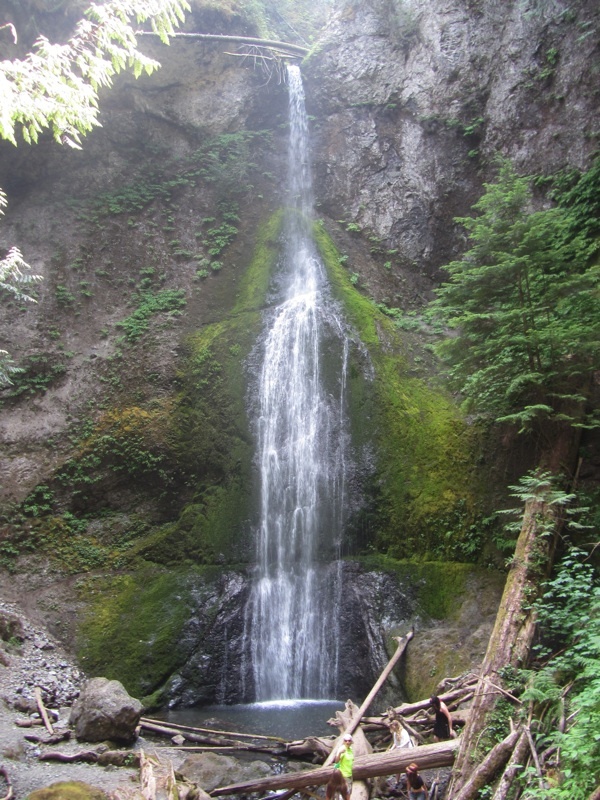 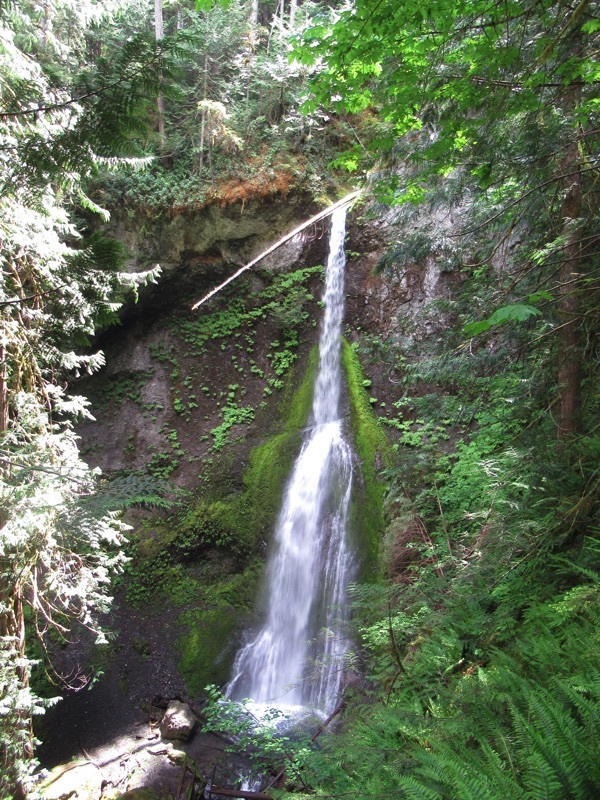 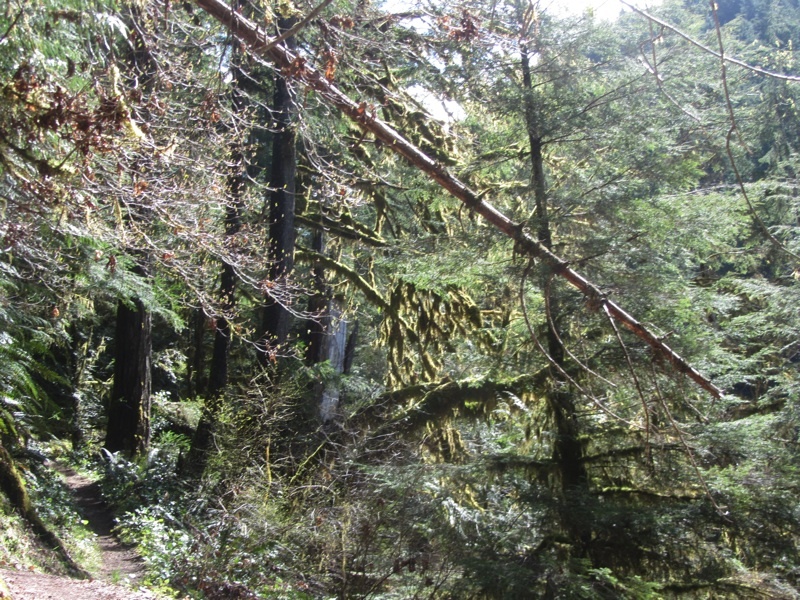 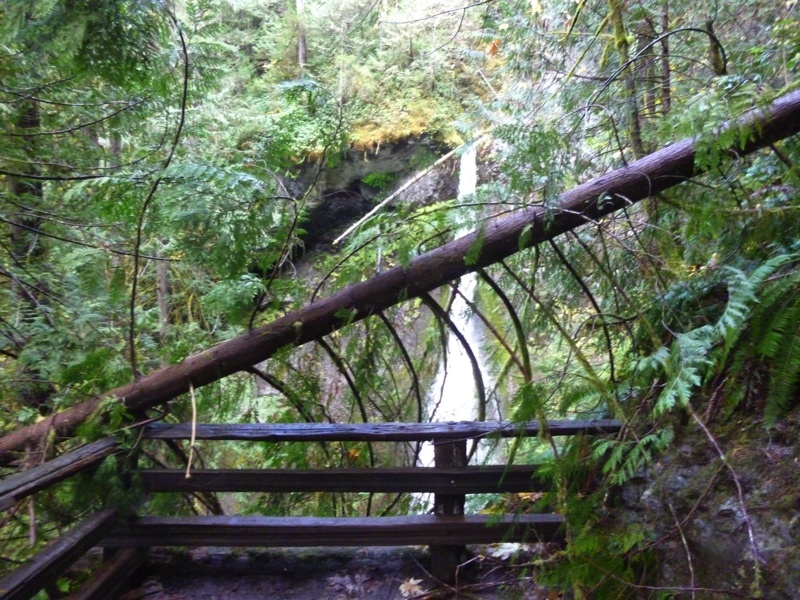 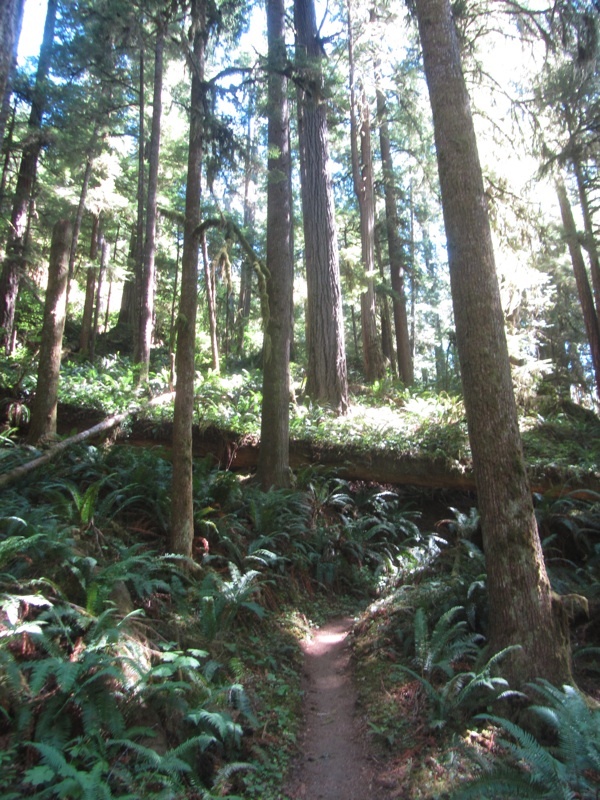 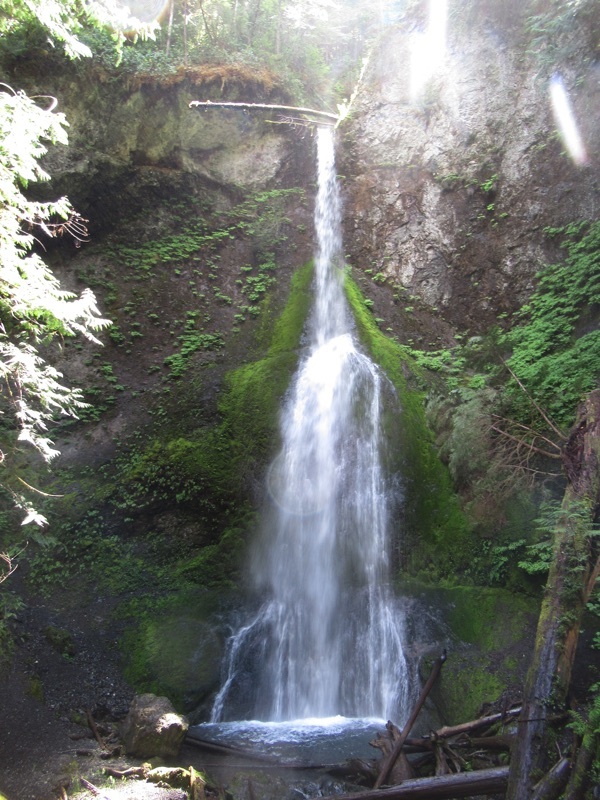 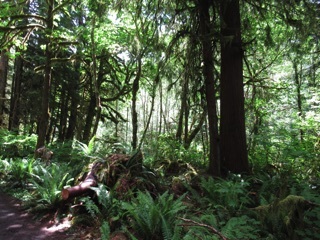 The Marymere Falls trail loop has reopened. It was possible to reach the overlooks with views of the falls, but the lower part of the loop was damaged last fall. 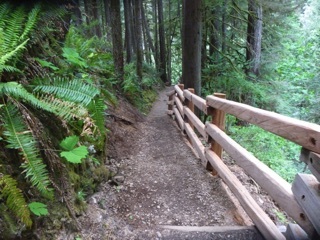 It has since been repaired with a long section of new handrail. 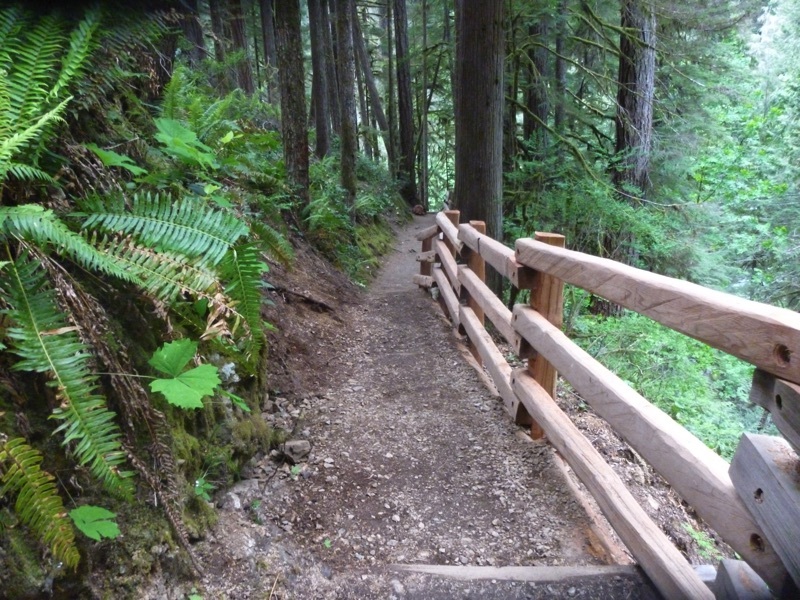 With so many roads and trails still recovering from winter damage, it’s good to see a part of this popular trail reopened. With all the rain, we had to get out and see Marymere Falls. 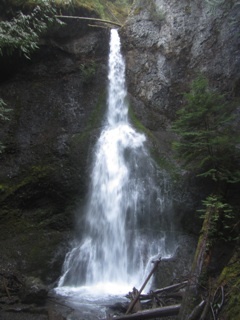 We were pleased to see the falls were in full rush and Barnes Creek running wild and rapid. 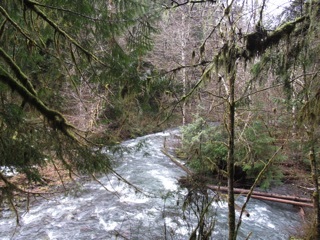 We couldn't walk the full loop to the two falls overlooks. The lower approach has been damaged, so we went to the upper overlook first. 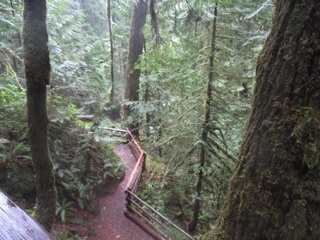 There was a branch down there blocking a lot of the view, so we walked down the steps to the lower overlook and really enjoyed the view down there. 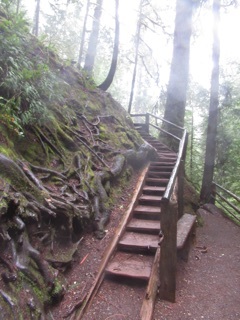 OUR ADVICE: If you do go to Marymere Falls and are disappointed by the blocked view at the upper overlook, head down the steps for a better look. 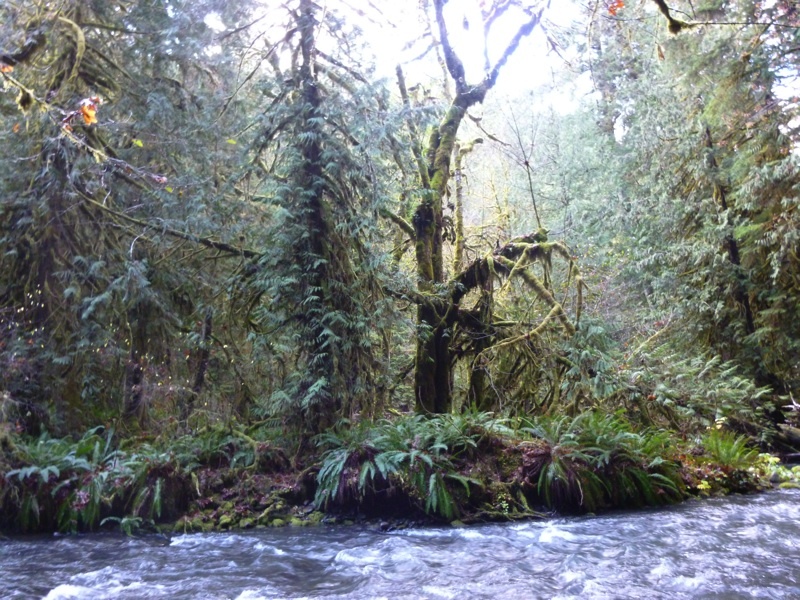 After visiting the falls we wandered up Barnes Creek a bit and enjoyed the water in full rush, surrounded by ferns and mossy trees. There was a bit of fog, so the hills above and more distant views were shrouded and hazy. 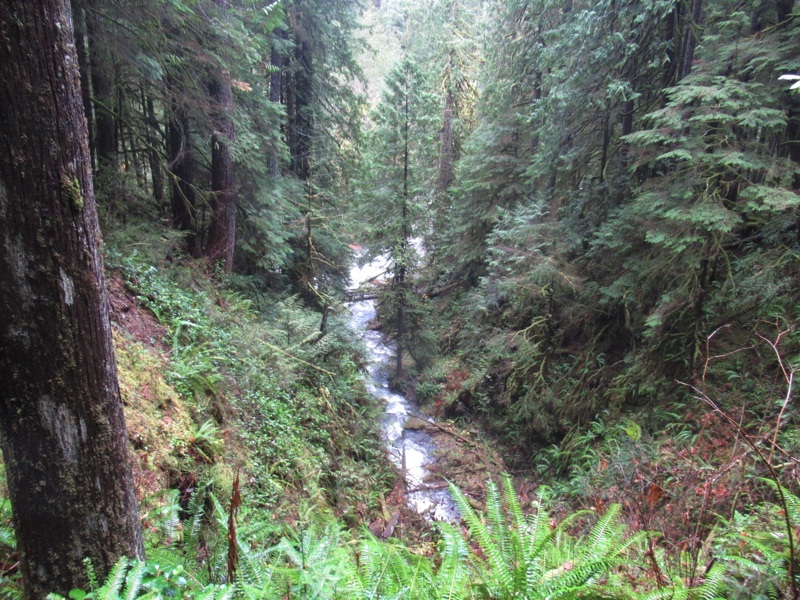 It was a perfect northwestern forest experience. This has been a dry summer, and it shows. 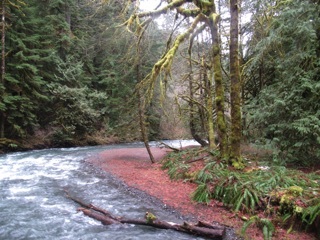 Rivers just aren't flowing the way they usually do at this time of year. 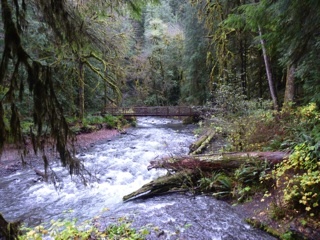 They're about a month or so off, with the current August flow more like the usual flow in late September. 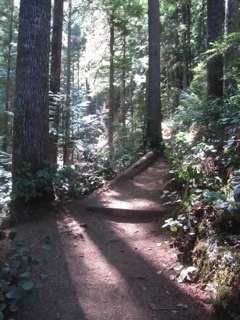 The trails are dry, too, with crumbly dirt and lots of loose pebbles. 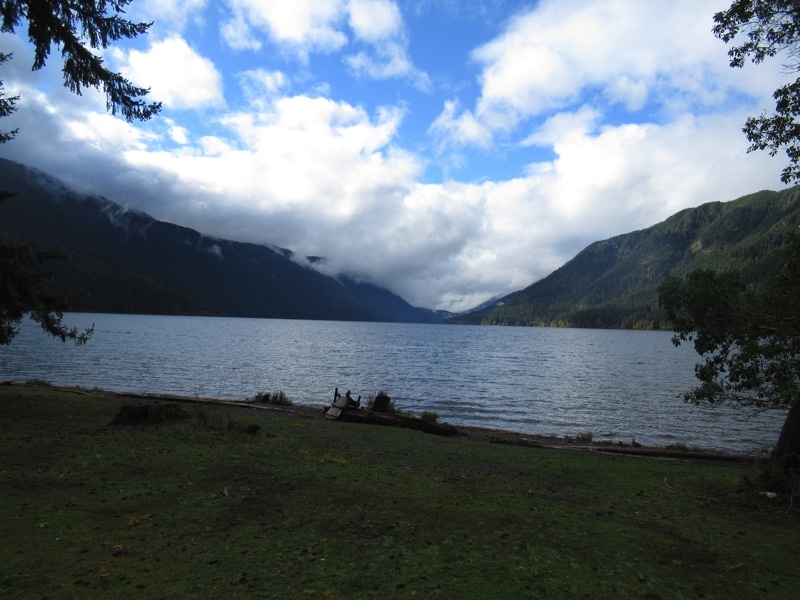 In search of water we went to Barnes Creek and were pleased to see that Lake Crescent still has a fair bit of water. We started climbing the Mount Storm King trail to get a better view of the lake, but we didn't get far. 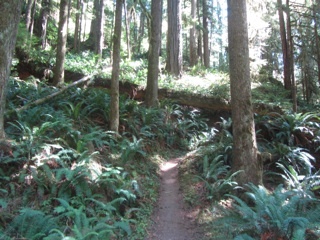 The trail was crumbling, and it is a steep trail. 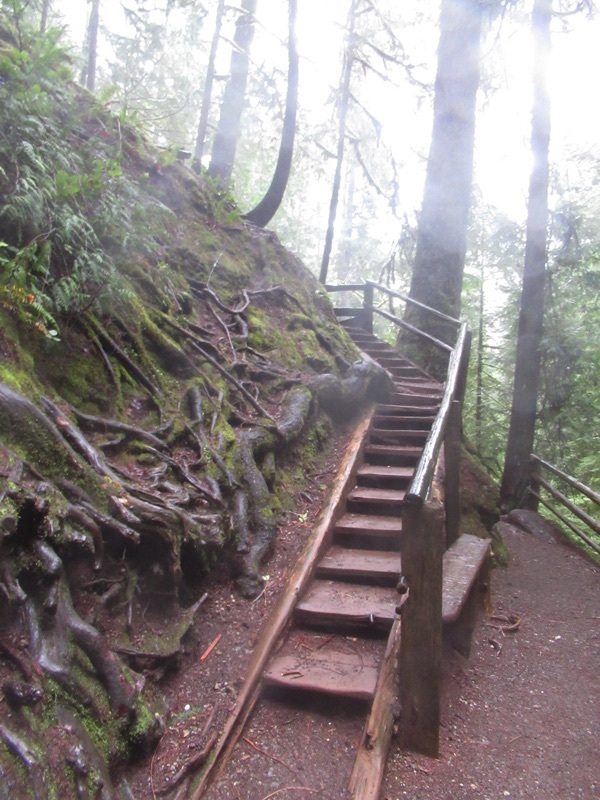 If we were slipping on the way up, coming down would be treacherous. We turned around and took a look at Marymere Falls. 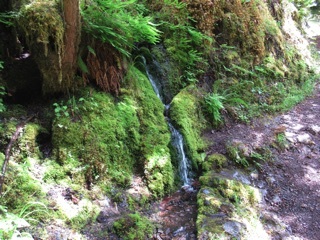 It was nice to see some flowing water. 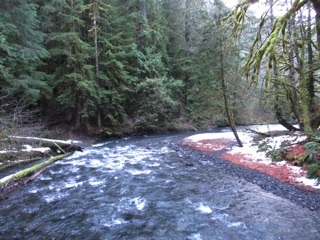 At the pebble beach we could see just how low the flow was in Barnes Creek. The river was much narrower and the beach much larger than usual. Then we walked a bit up the Barnes Creek trail and got a few glimpses of the river. 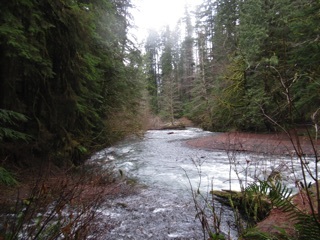 We got our water fix, at least for now, but we're hoping for some real rain. 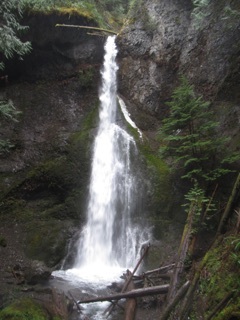 We visited Marymere Falls on the south shore of Lake Crescent with some trepidation. 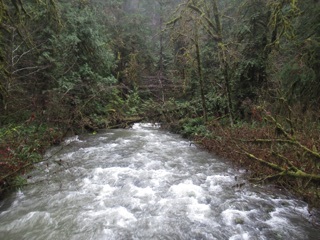 The drought this year has been serious. We could tell there was a lot less water this year by the time we crossed Barnes Creek, but the falls were flowing, just not as much as usual. 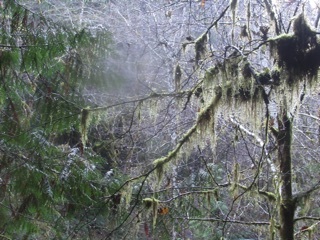 Small comfort, but this year, we'll take what we can get. We've been getting out to the Marymere Falls a fair bit lately. 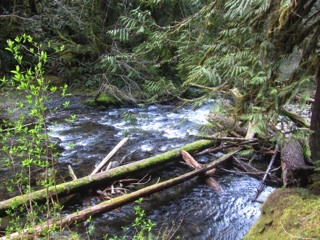 This time we decided to head up Barnes Creek a bit and see how spring is progressing in the valley. 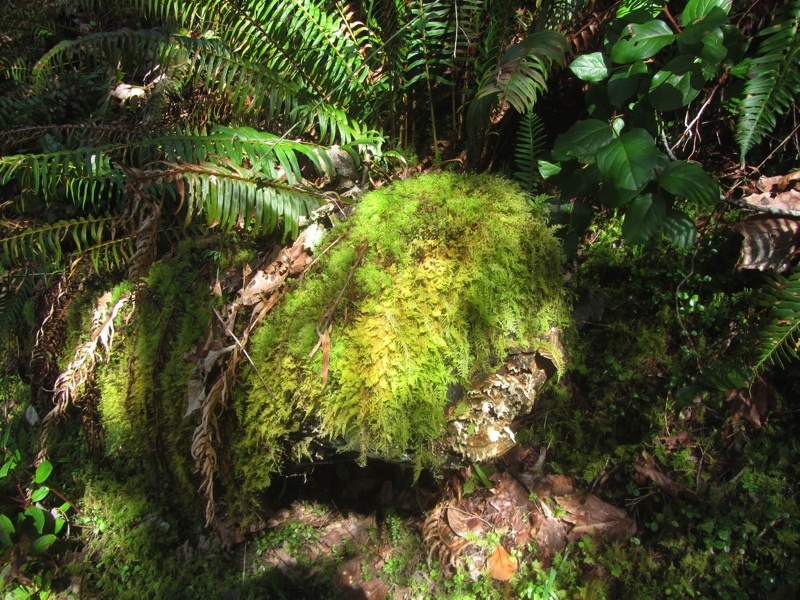 The whole area is a riot of green with the trees, ferns, mosses and undergrowth all contributing to the wild forest scene. 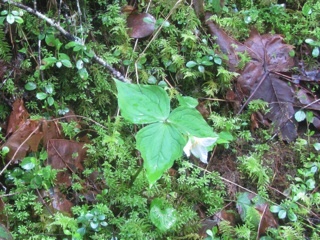 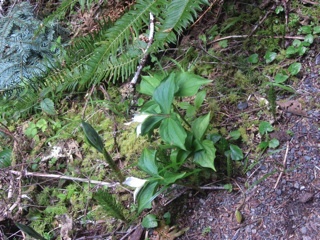 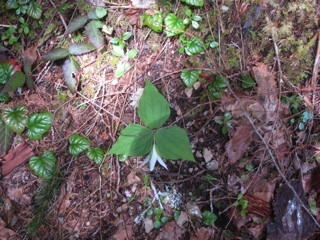 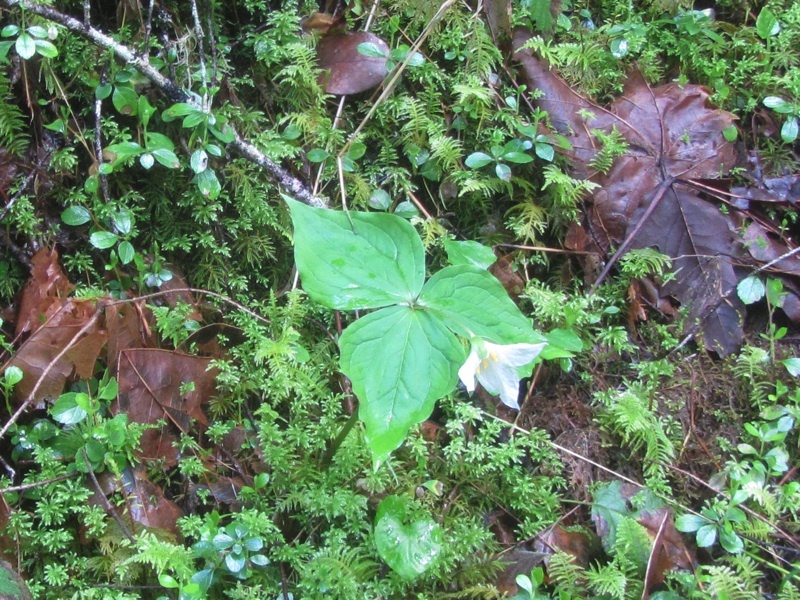 There were also trilliums in bloom, another sign of the season. If you do get out to the falls, consider following the creek a bit and checking out the spring scenery. 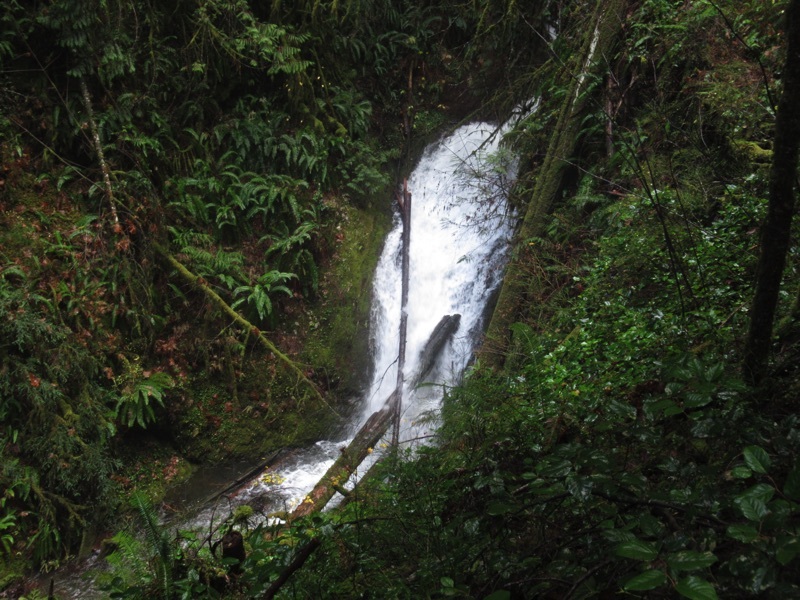 We recently went out to Marymere Falls to stretch our legs and see how our winter rains have been affecting the falls and Barnes Creek. Well, there was lots of water, but there were also a lot of downed and damaged trees. 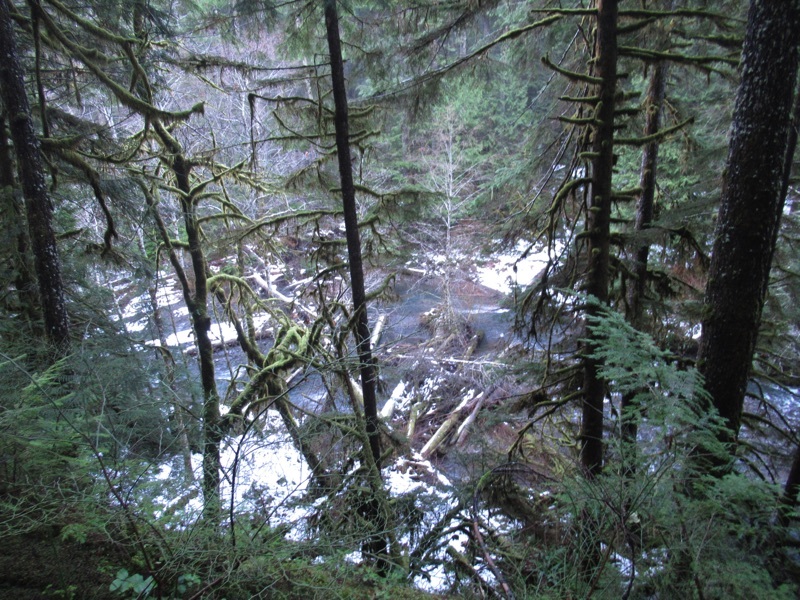 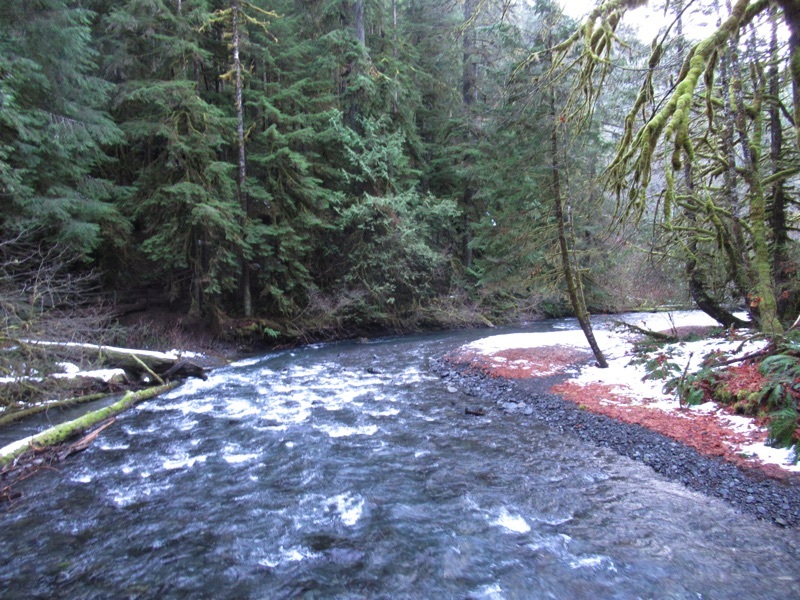 Even before we could hear the creek, we started noticing the winter's toll on the forest. 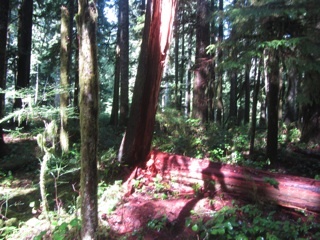 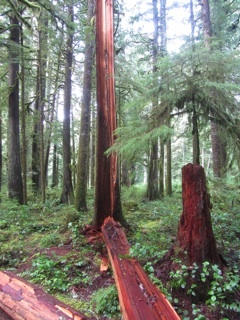 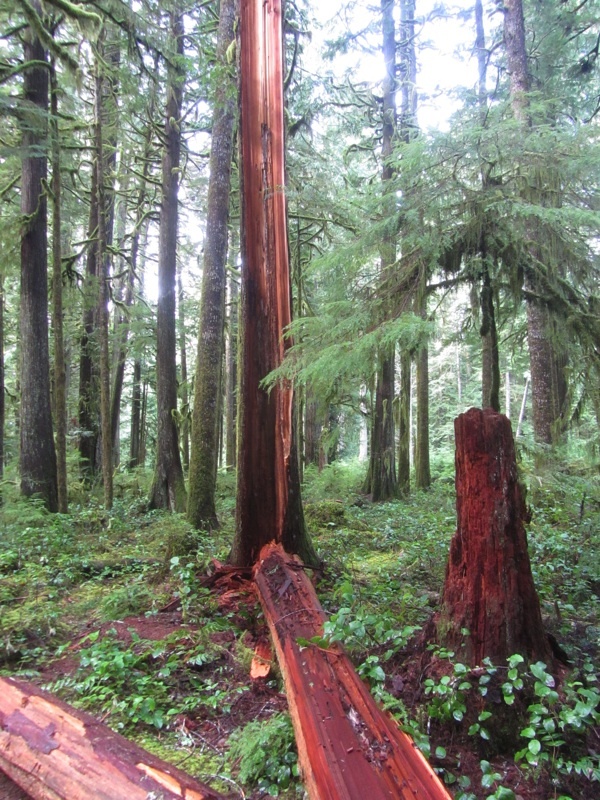 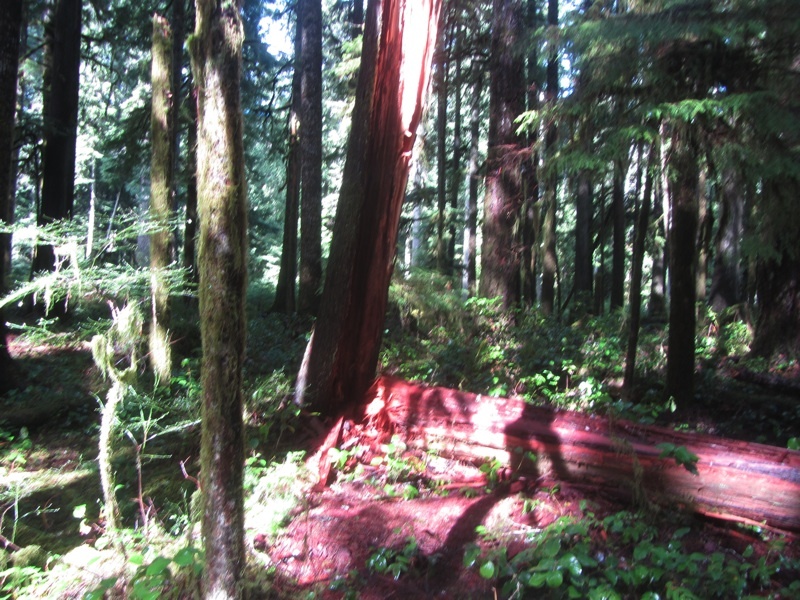 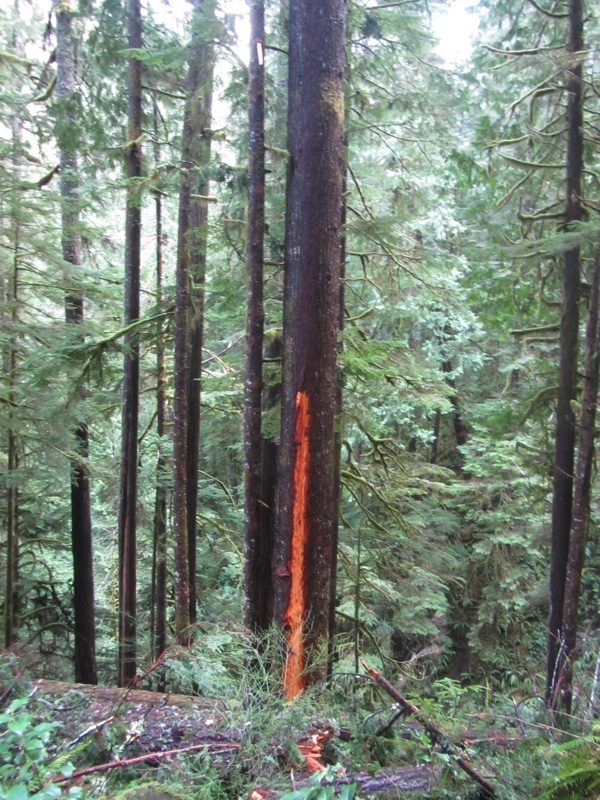 One tree split vertically, with half remaining upright while the other half had fallen across the trail. 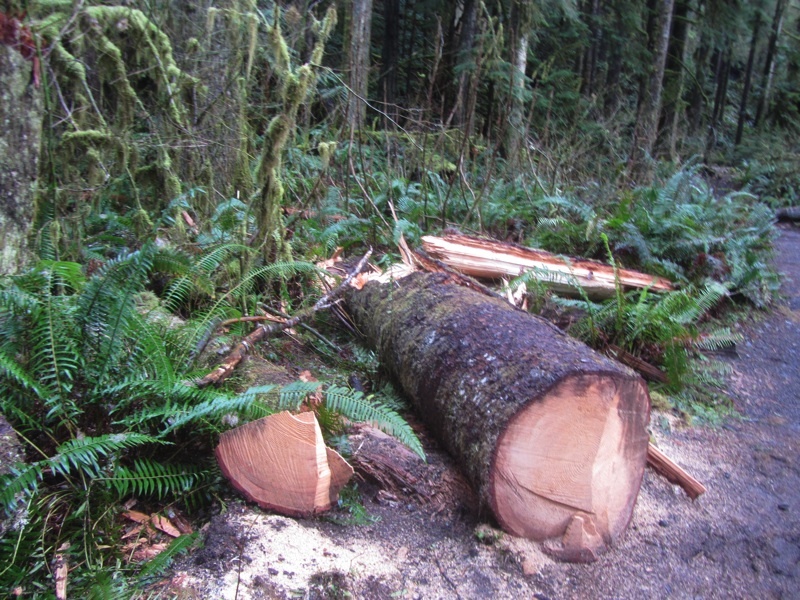 The park service had cleared the trail, cutting out a section of the fallen tree. 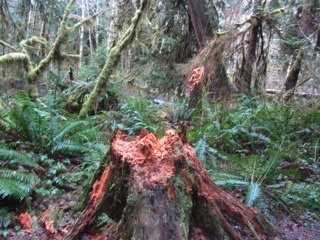 We stopped to take a closer look, because the inner wood of the fallen tree looked particularly smooth and fine grained. 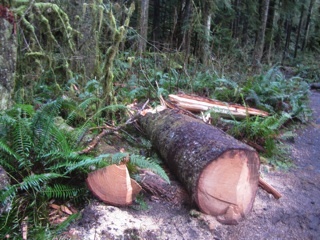 It was heartwood. 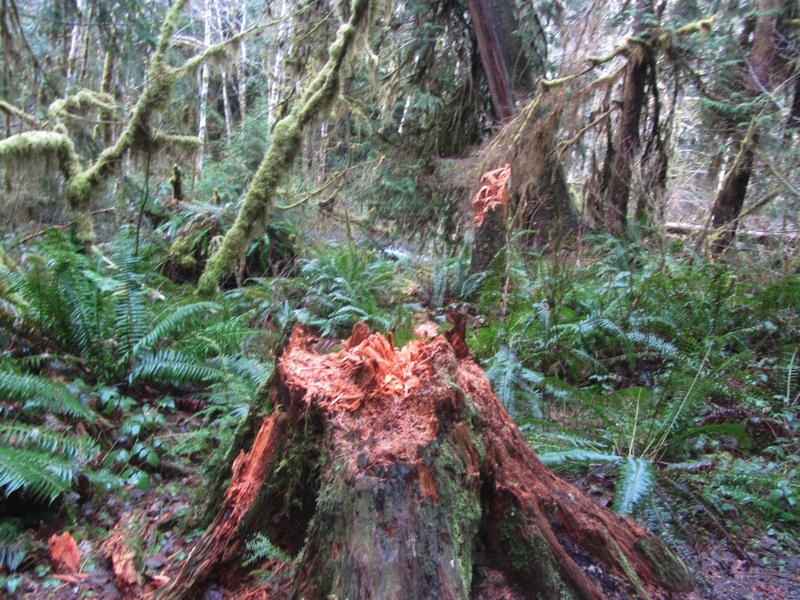 It has a different look, a different feel and even a different sound when struck, as opposed to the younger wood in the outer layers of the tree. 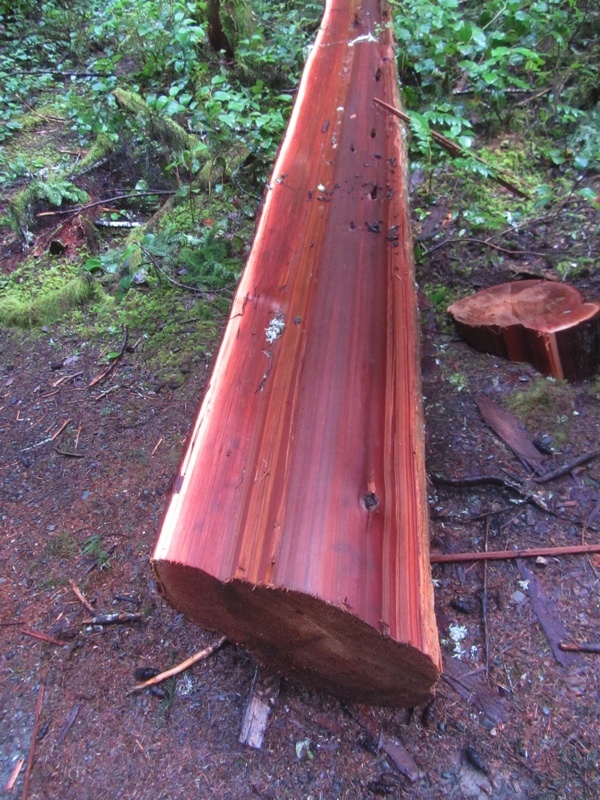 We could even see the color gradient as the outer layers were paler, almost yellow, but the inner layers were increasingly dark before turning into heartwood. There was also lots of flowing water. Marymere Falls was in full spate. 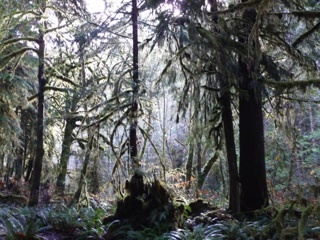 Click on the picture to check out the movie. 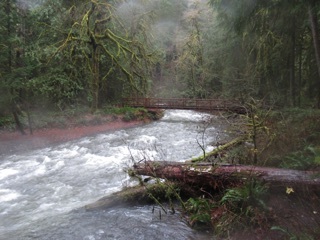 Barnes Creek was roaring. 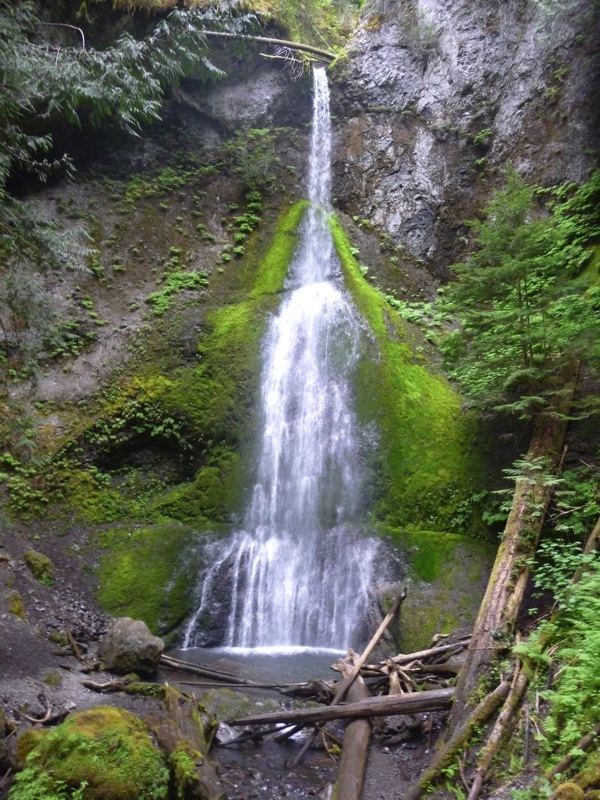 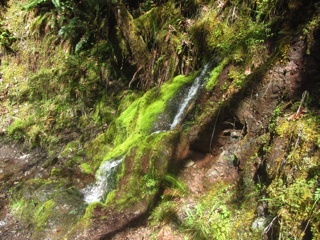 This is a great time to check out Marymere Falls. 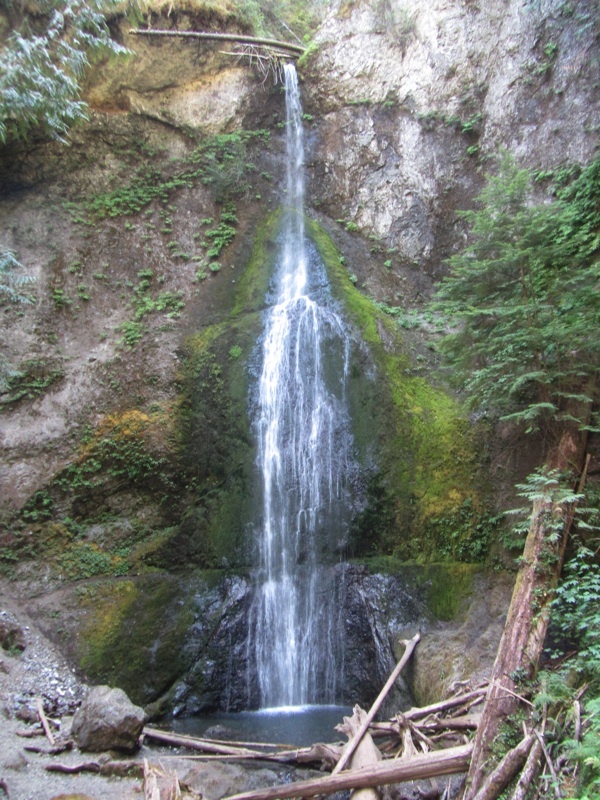 Marymere Falls - Click the picture for a video. 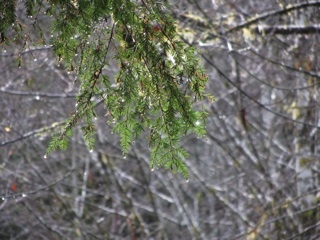 Rain drops - They add up. Heartwood - Note the color gradient from the outside in.